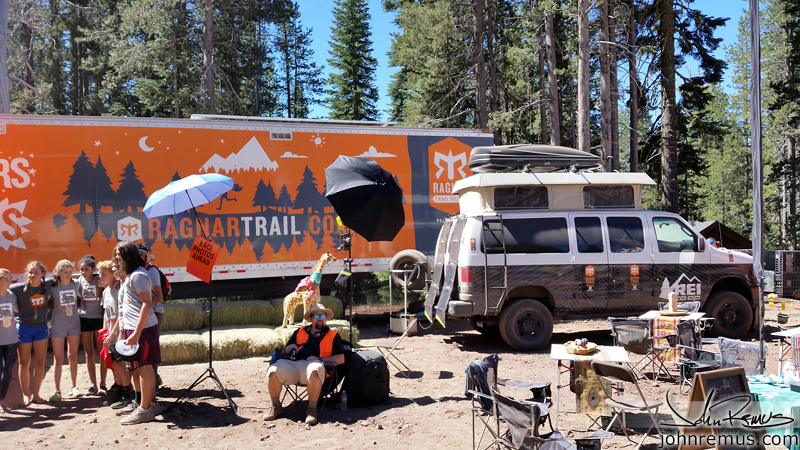 I would occasionally check the Ragnar Facebook page and read the updates. And I also follow them on Twitter so I knew the race was approaching. 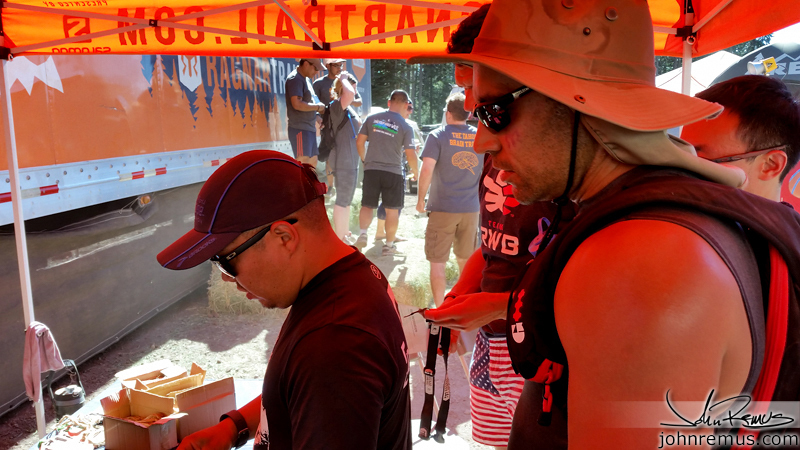 About two weeks beforehand I checked FB and found Michael and his team Watchdog6 that was part of the CW2 Balli Foundation that he started with his mother, in memory of his late father who was killed in action in Afghanistan. Both Michael and his mother Kristy would be racing and their team had a few open spots left. I reached out to Michael, and shortly after was added to the team. Sweet. I did very little training for this race. That’s actually been a theme for me this year it turns out and part of the reason I’m doing another full-Iron in December since I’ve kinda stopped taking training seriously my last Iron. 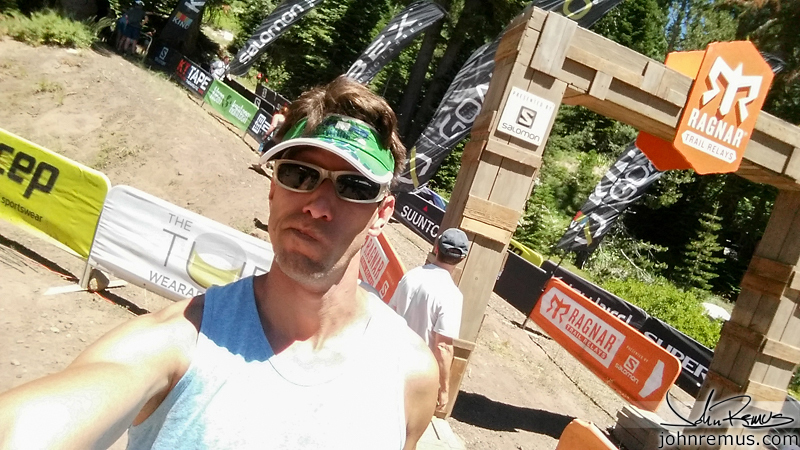 Somewhere in the back of my mind I look at shorter races as not needing training… it’s a bad habit I got into. Plus, let’s be real. 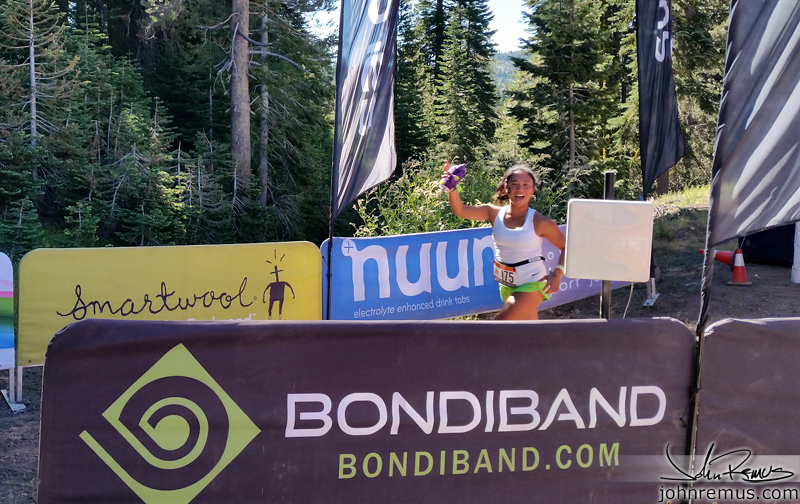 I joined the team two weeks before a race… how much training can you really get? (a lot. Shut up. I know. Lemme enjoy my excuses). 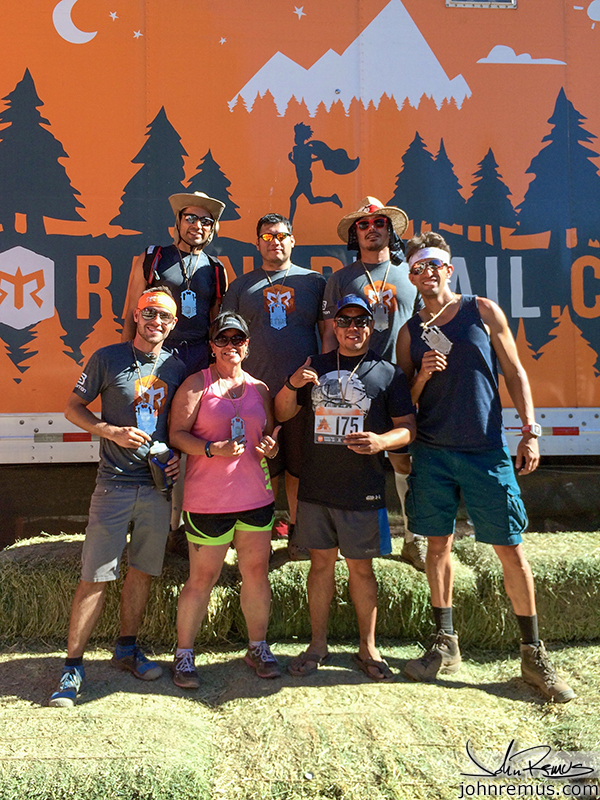 Ragnar Trail is a three-loop eight-member relay race. In the mountains. Each team member has to run every loop once. 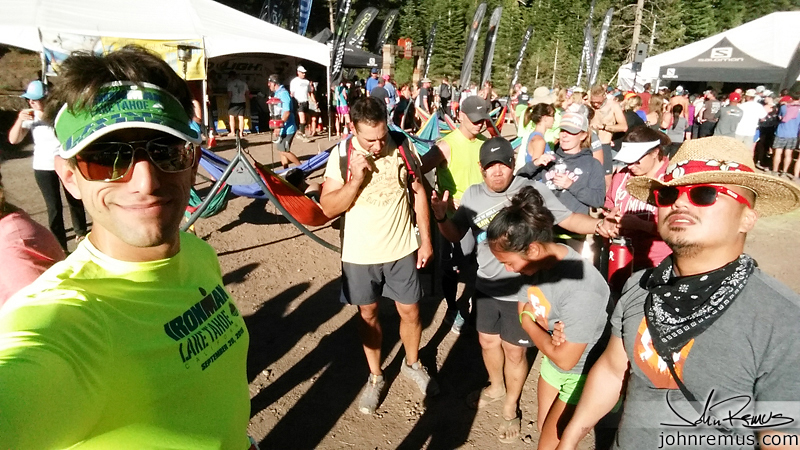 If you’re a badass (or just an over achiever) your group can do a four-man “Ultra” team and run each loop twice. 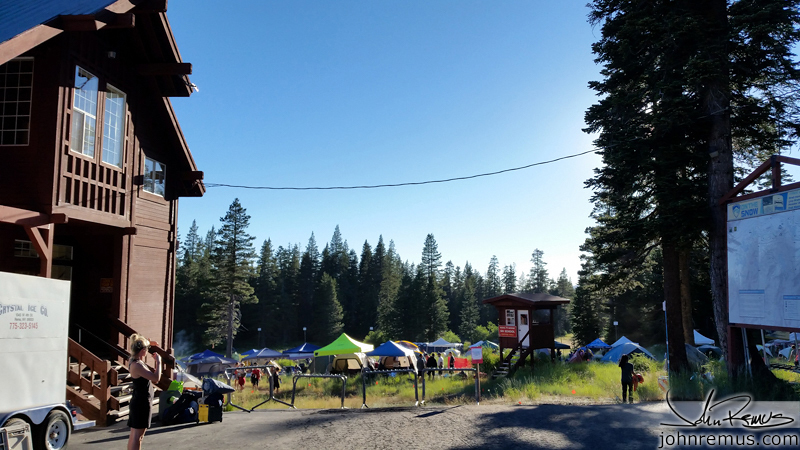 The total mileage on this course is approximately 16 miles per person in the standard 8-person race team. So you can understand why I wasn’t going to train beyond my normal routine, that’s not a hard distance for me to knock out in three pieces. As I said above, I knew what I signed up for. And I tried to nicely emphasize that to my new team in our video conference calls and emails. 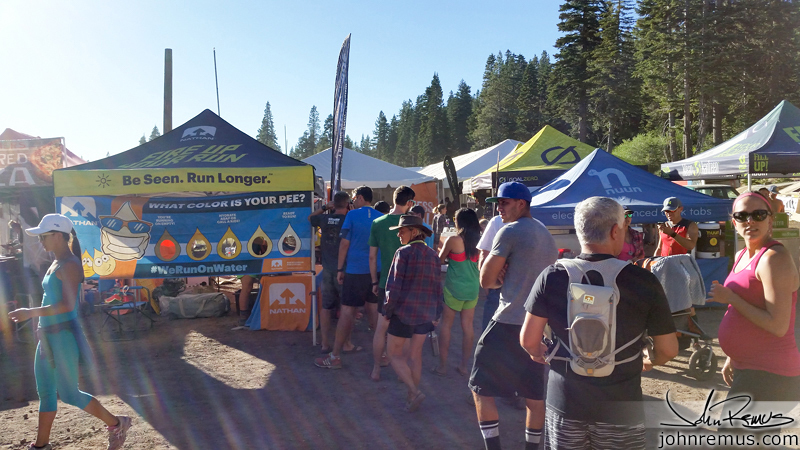 Running in Tahoe is no joke. It’s hard. 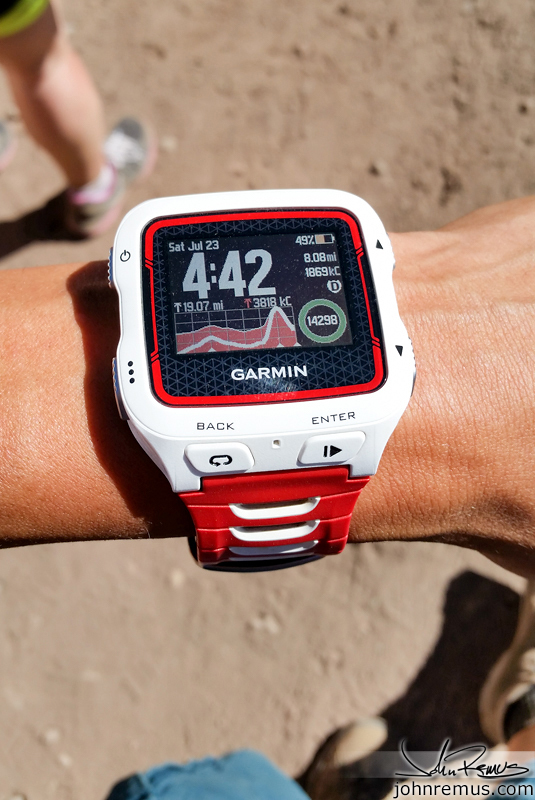 The altitude will make you feel like you can’t breathe when you start running. The light is harsh and bright. And the sun will burn you quicker than at sea level. At home I can run a 10k in about 45 minutes without additional training. 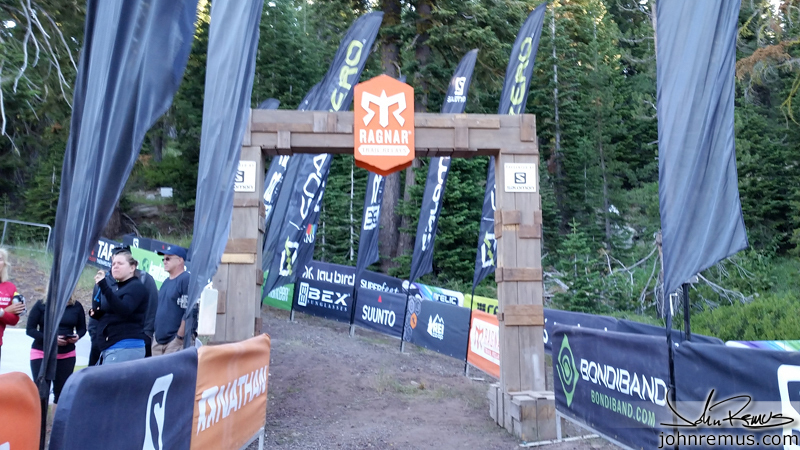 I already knew that in Tahoe that same distance takes me closer to an hour. So throw in some mountains that I have to run up? I figured 1 hour and 15 minutes for the 7 mile loop. 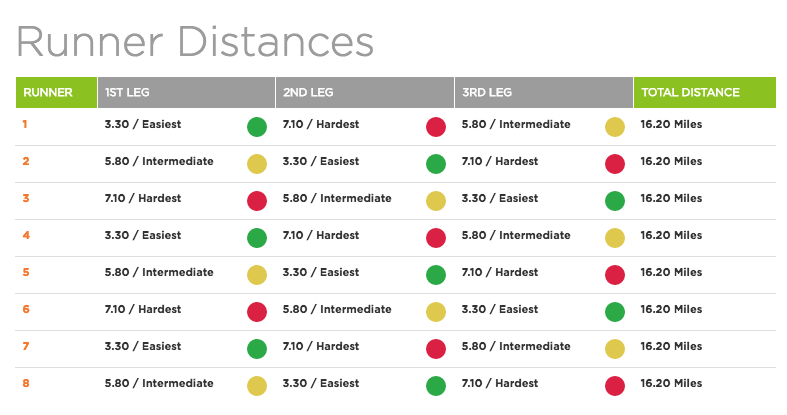 Those of you who do a lot of races, and particularly triathlon, know that course research is really just part of proper planning. 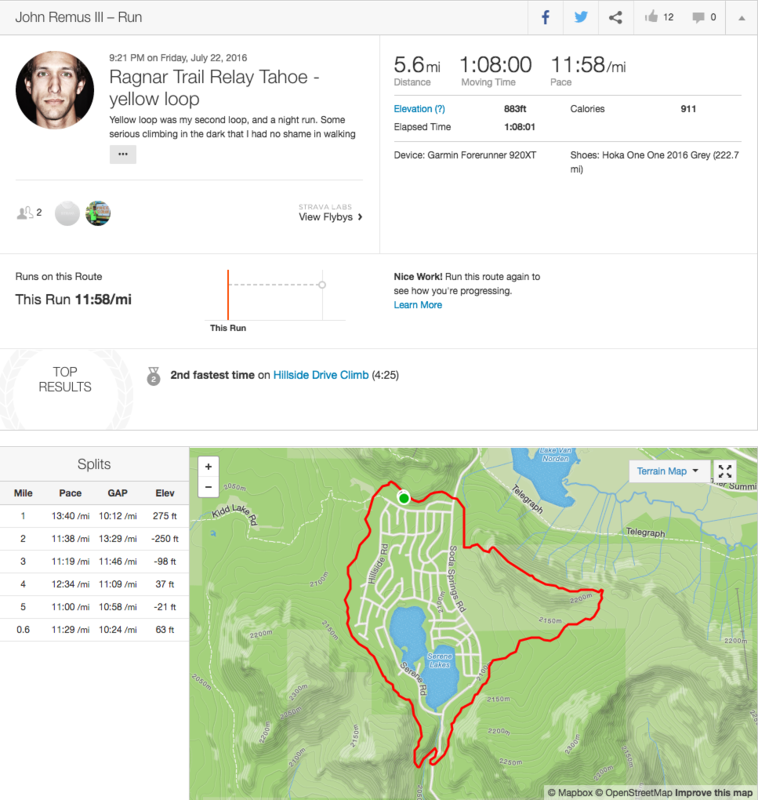 So I started searching for data on Strava/etc for this course. 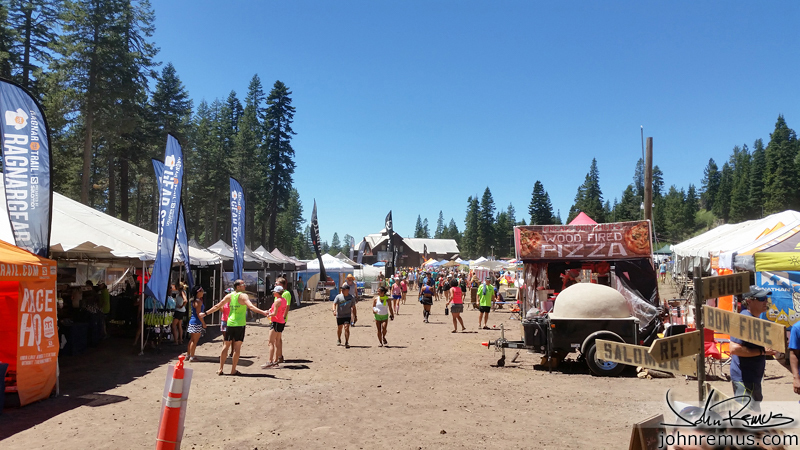 I also found only two, very short, race reports about Ragnar Tahoe. Which is why this one will be long and overly detailed for those who _want_ a lot of info on this course. 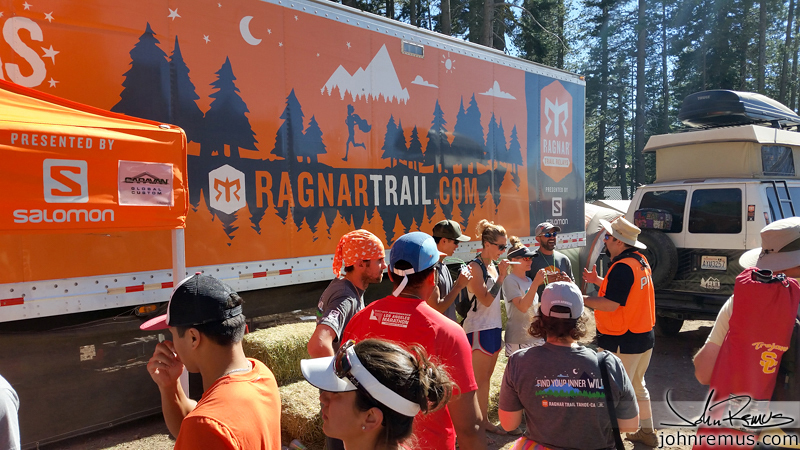 So what did it take to do Ragnar Tahoe? 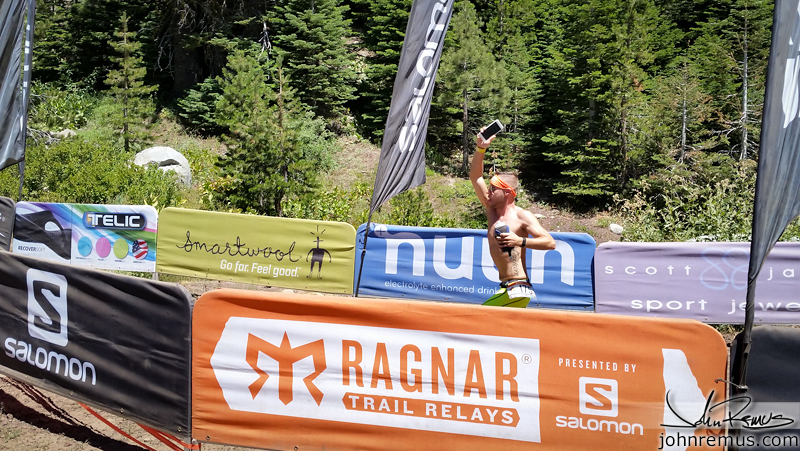 Ragnar breaks down the event into three loops. 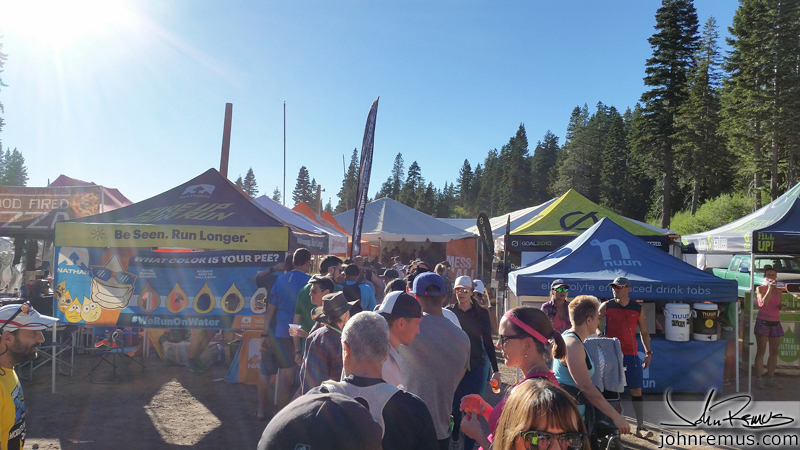 You’re running at Royal Gorge Cross Country Ski Park. Which is near Donner Lake. Nothing looks bad as some squiggly lines, right? The distances will give you a better idea of what you’re looking at. I selected Runner 3. There were two reasons for this. One, I liked the idea of a reverse race. 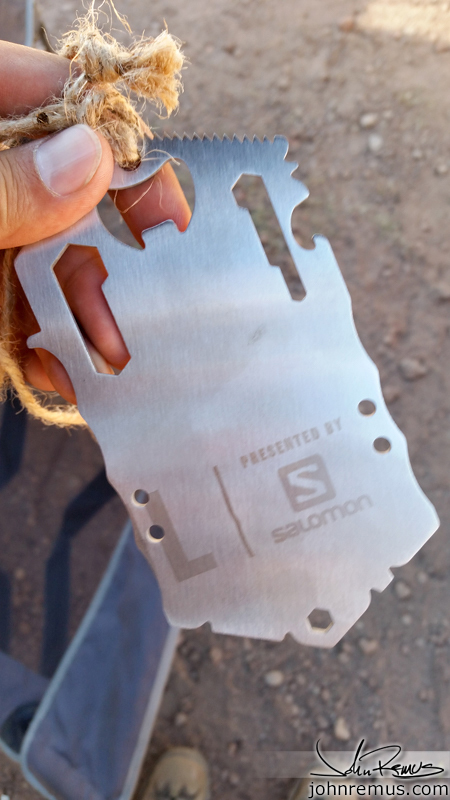 Hardest first, then Intermediate, and wrapping up my race with the “Easy” leg. The second reason is that I figured I would be running the “Hard” loop in the middle of the day. 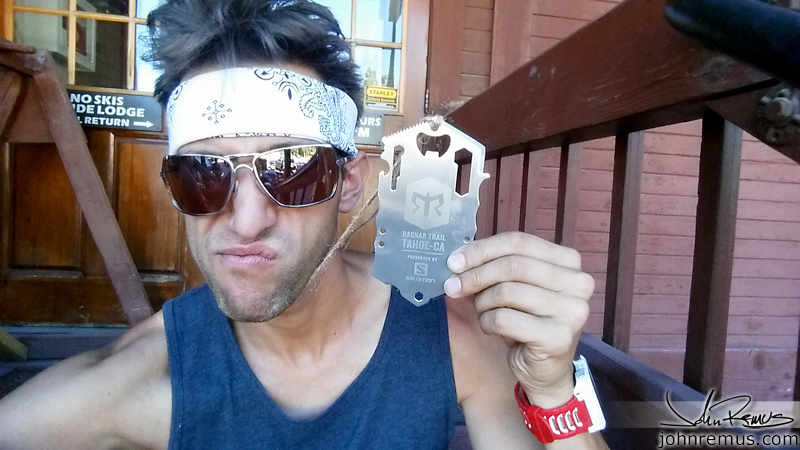 So if I could take that physically-demanding race in the heat from someone else, I would. Literally any time of day that wasn’t Noon would be easier for anyone I felt. But the thing I wanted and couldn’t find online was solid information on elevation. I wanted to see elevation charts. Really, my triathlon side wanted a damn Strava map. Haha! So for those curious I’m going to also directly link mine for anyone interested in doing this event. That’s a pretty scary stat, right? I’ll further explain. As you see on the chart above there are 24 legs of the race to be completed. Eight people. Three each. Remember? 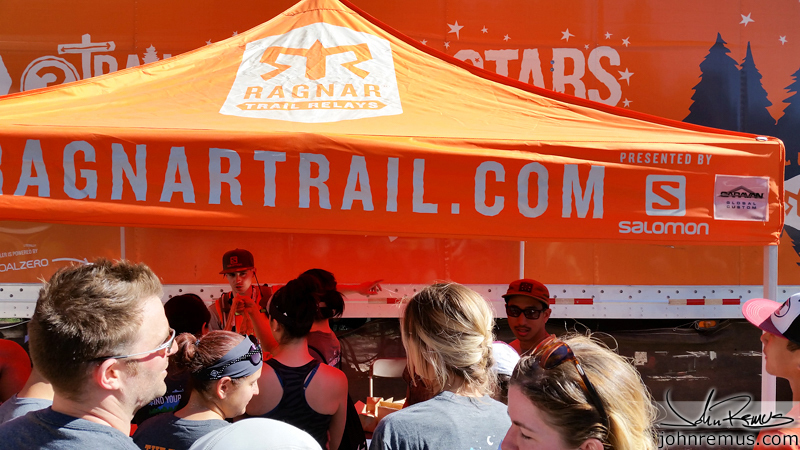 Ragnar assigns your team a start time based on your expected speed. 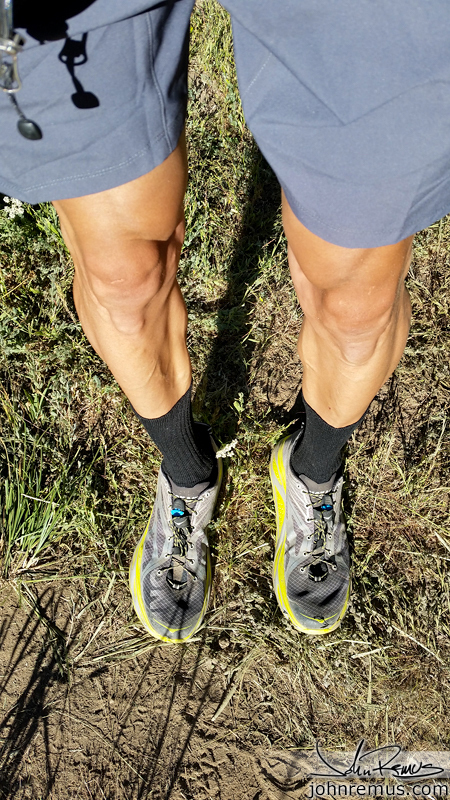 But SO many people clearly overestimate their ability to trail-run at altitude. And they either wear themselves out, or were simply undertrained for this race. 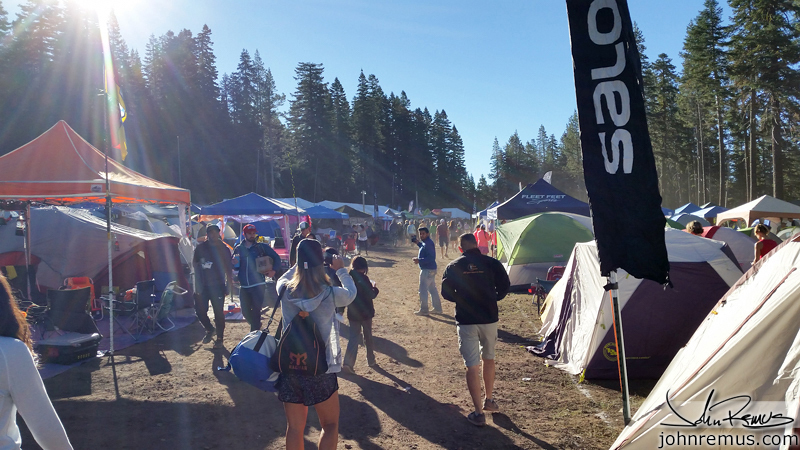 There were actually 227 teams in Tahoe this weekend. 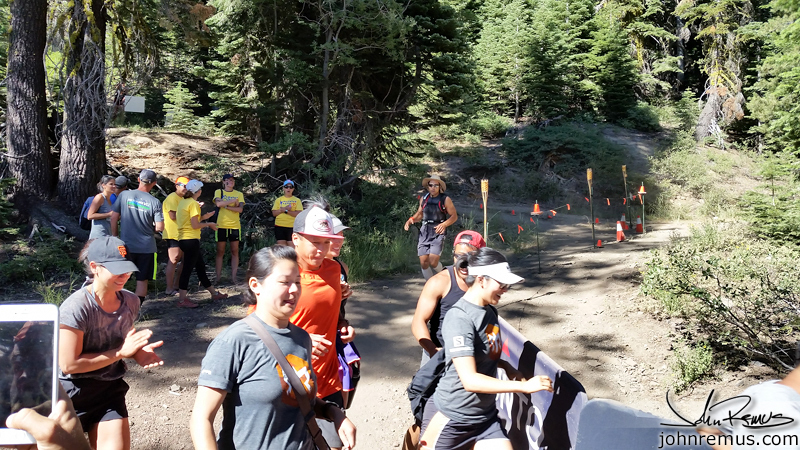 If teams start to fall behind schedule then Ragnar will double-up runners. 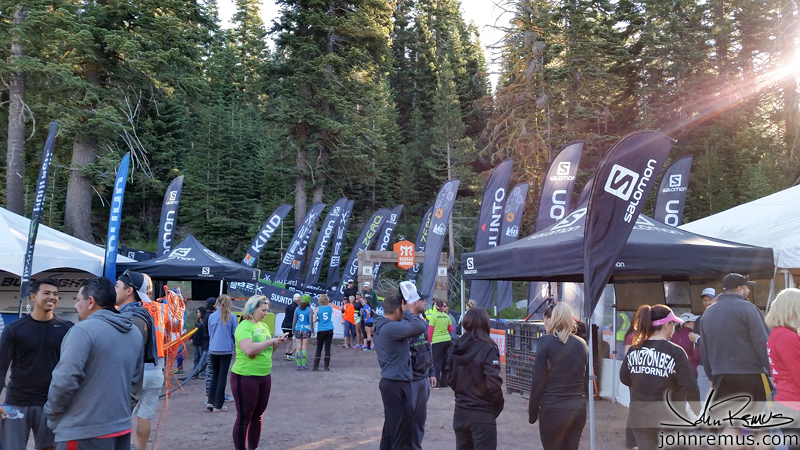 This means that when “Bob” is out doing his Green Loop, then they will _also_ send “Jim” out to run his Yellow loop and there will be two runners on the course at the same time (which is no longer a relay). If you read other race reports online you see this happens frequently. 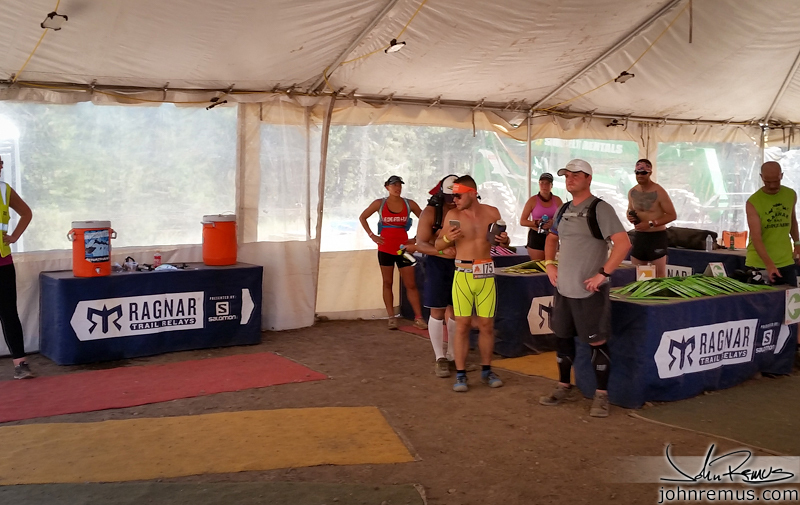 55 of 227 teams had to double-up runners, that’s 24% of the field. Yes. 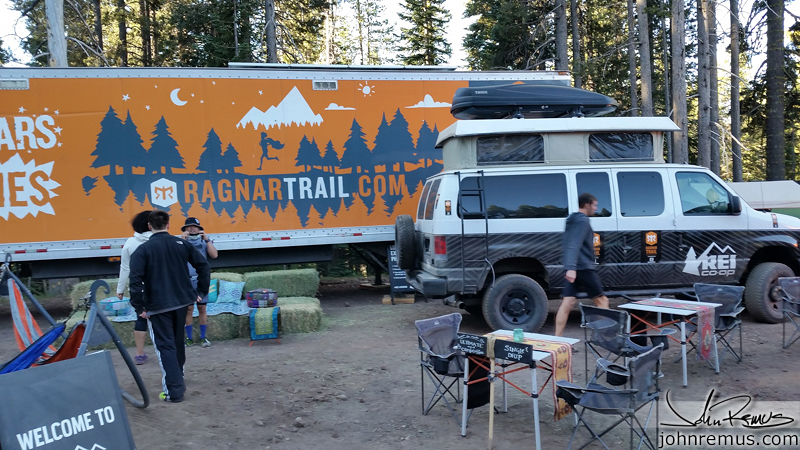 This means that Ragnar is about the experience and there to be enjoyed by the competitive, the casual, and the partiers alike. This is not an entirely horrible concept. Personally I consider failing to finish the race by the rules set, in the order and manner the race is designed, a failure. 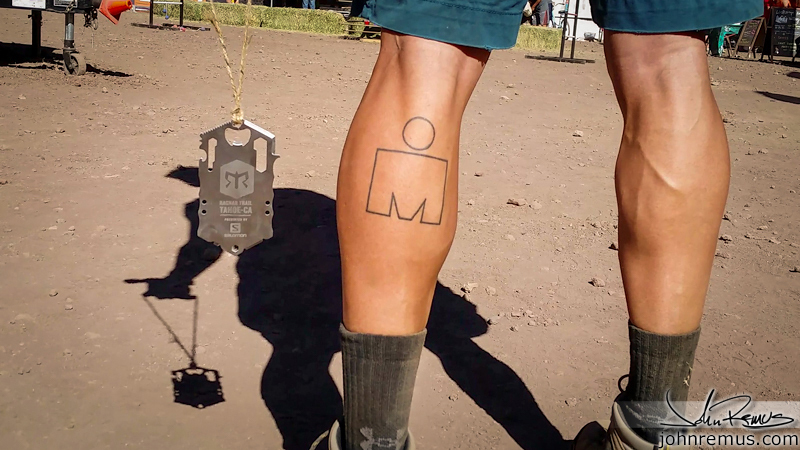 Your team is missing data on legs of the race. It’s incomplete. Officially this is a DNF. But, again, Ragnar wants every team to have a shot at finishing. 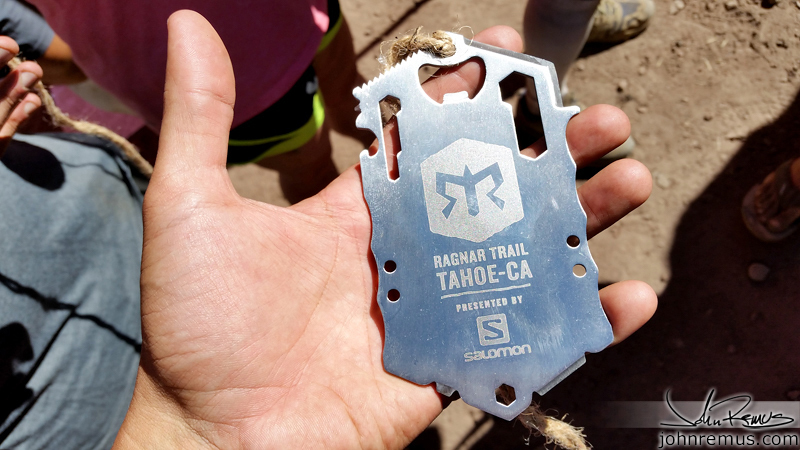 And if you get all your guys out on the course and all still run your legs, you will have your finisher (or maybe now a “completion”) medal to bring home. But of course your team is not eligible for awards/etc. So my team finished, on time, on schedule, and in order. We were team 162/227 teams. This was a solid finish for a group of several random last minute adds like myself. Also, a group of very mixed ages and athletic ability. Online this loop is listed as 7.1 miles. However with my Garmin 920 I clocked 6.9 miles. 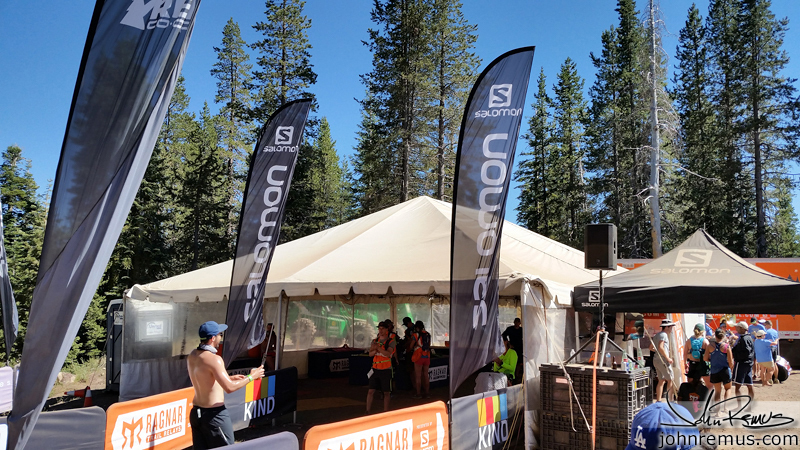 When I left the transition tent I told Michael (who I was bumping that weekend) that if I had a good run I would be back in 1:15. And I only missed that mark by 14 seconds. woo! 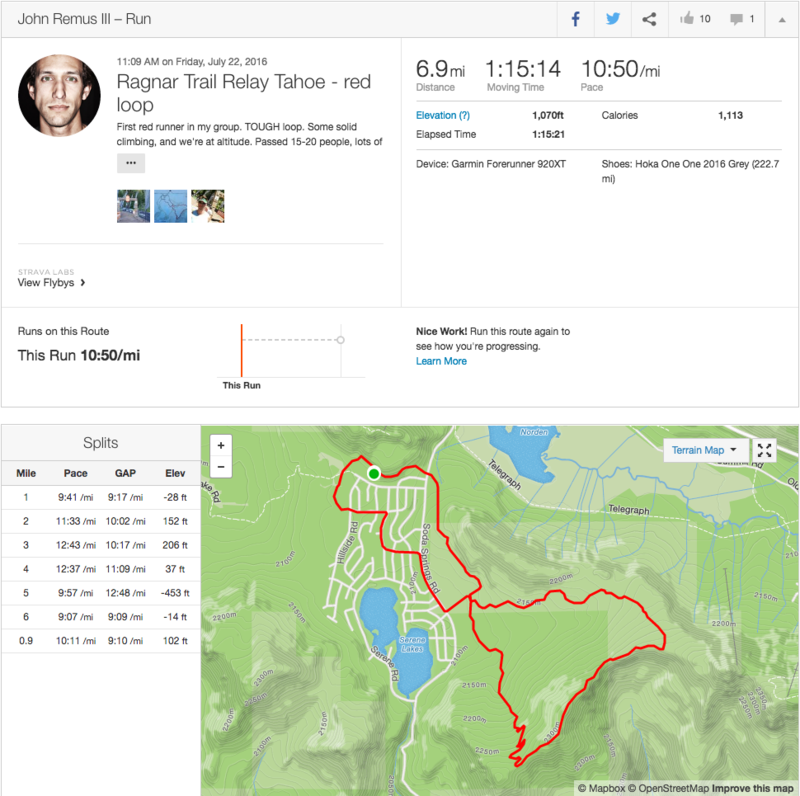 NOTE: The run is clockwise, and does NOT do a figure eight, you’re just briefly on the same trail in the middle section like street-traffic. This loop is no joke though. Everyone online and in camp was saying “Yellow is the hard one, Red is just longer with a technical descent”. And that turned out to be wrong. Red Loop is hard. The first two miles or so you’re running through the forest. It’s shaded, and quite nice. And the climbing isn’t too bad. But after that it keeps going up, and up, and up. And you’re now in much more sunlight. At mile 2.4 you hit 16.5% grade! You can see my pace drop at major grades. That first major peak you see above is when you come out onto the ridge. This is really deceiving because in the middle of the day you can’t see the trail ahead along the ridge, and don’t see that you’re still climbing. 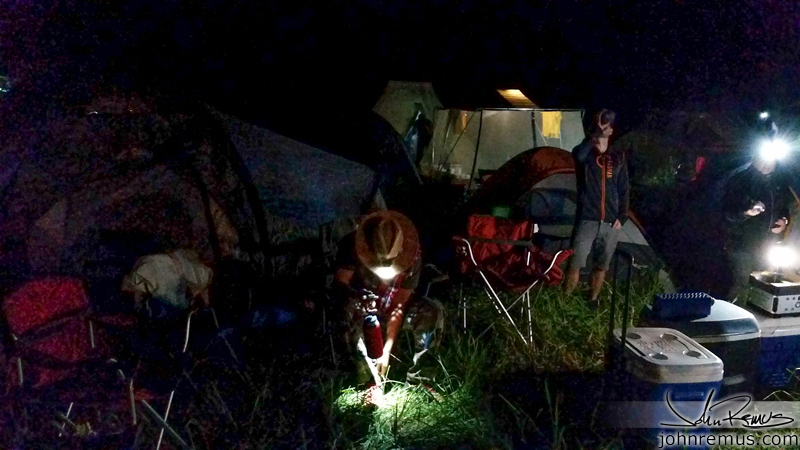 I heard from the night runners that they saw headlamps along the ridge as a sobering warning of what lay ahead, however. See the spot at 3.1 miles where my pace just plummets? That’s me _hiking_ because you’re at a 22.2% grade! After those three peaks though you can pretty much tell it’s going to be downhill from here. The descent was FAST. And dangerous. I had to be careful not to trip as I ran down the rocky, dusty path. The descent down you hit grades as steep as -20.9%, which is just insane. But after you’re off the mountain you’re back in an open field, the same one you ran through on your way toward the mountain. But this time as you exit out you make a hard left turn and head to the road. This flat land part I tried to balance out my pace a bit again and make up time from the climb up. 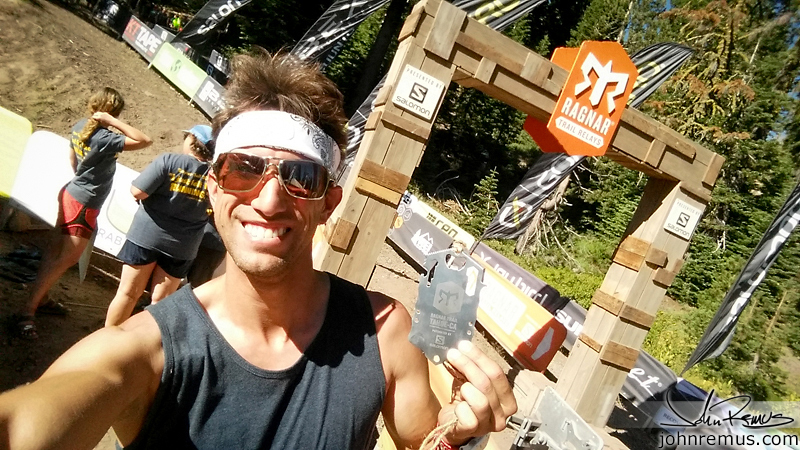 I was bouncing around a 9 min/mile average – which is my usual altitude pace for flat land. As you re-enter camp there is a pathway that you will run up every single time for each leg (don’t camp in this area unless you want all your things completely covered with dust). 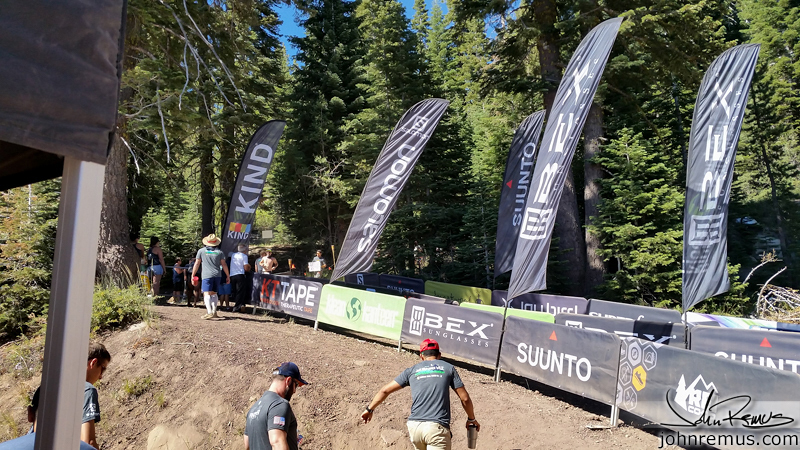 This last incline toward the end of your run has one last very sharp climb, before the sharper descent back into transition. 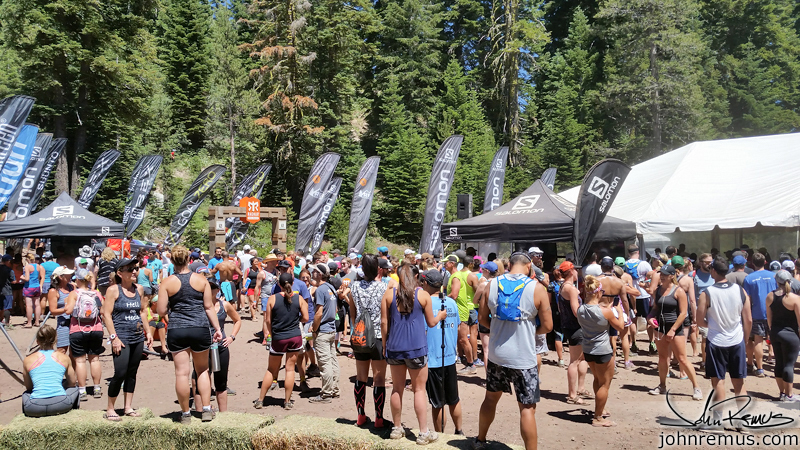 A lot of people were walking up in the heat, tired from their runs. My own pace dropped slightly at the sharpest climb, and then I picked back up and ran down to transition to Michael so he could start his Green Loop. I layered up since it was mid 40s – but quickly found I didn’t need my outer layer after heating up 1 mile or so into my run. My Ironman pullover was too warm, but my VIRUS leggings were perfect. Yellow is the loop everyone kept saying “is the hard one” but clearly that meant they hadn’t run Red yet. I knew there was going to be two big climbs in this run, so I was curious how that would be at night time, in the dark. As I stood there contemplating this, waiting for Nikki to arrive I realized I didn’t bring my flashlight and only had my headlamp with me. This loop is listed as 5.8 miles, but I clocked 5.6 with my Garmin. Let’s take a look at the elevation map.. Overall this is actually, visually-based-on-this-data, a fun looking run! And I bet during morning or evening it was awesome. 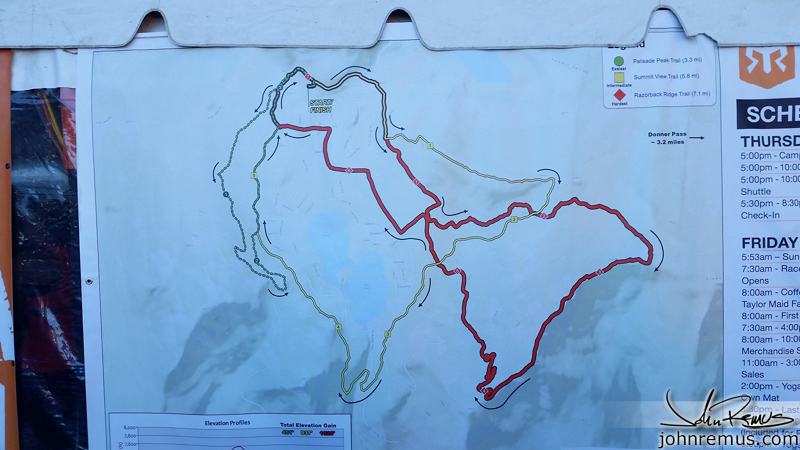 On the way out you will run the same first portion as the Red Loop, then take a hard left onto the Yellow course (the map above you see a 90 degree turn after that straight line at the start). At 3/4 of a mile you hit your first major climb. Everyone was walking. 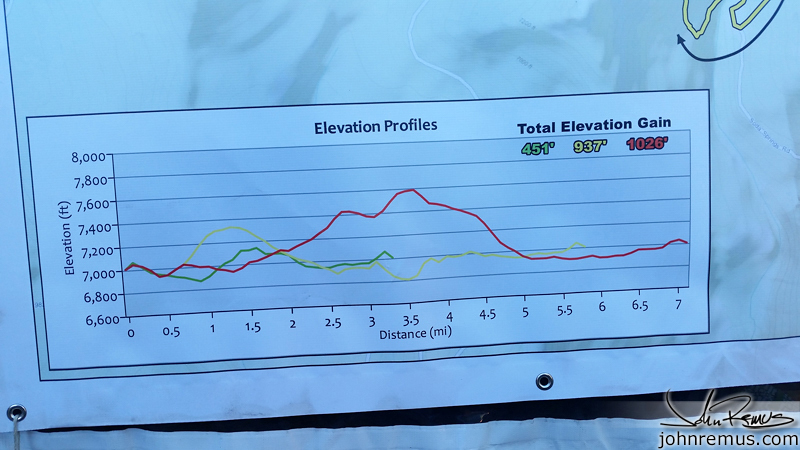 I had already passed several people again on this route, and then during the climb we all slowed to a hiking pace. Along the ridge there was moonlight and it was a bit easier to see. I wanted to stop and enjoy the stars but I also wanted to make up some distance after the slow climb. 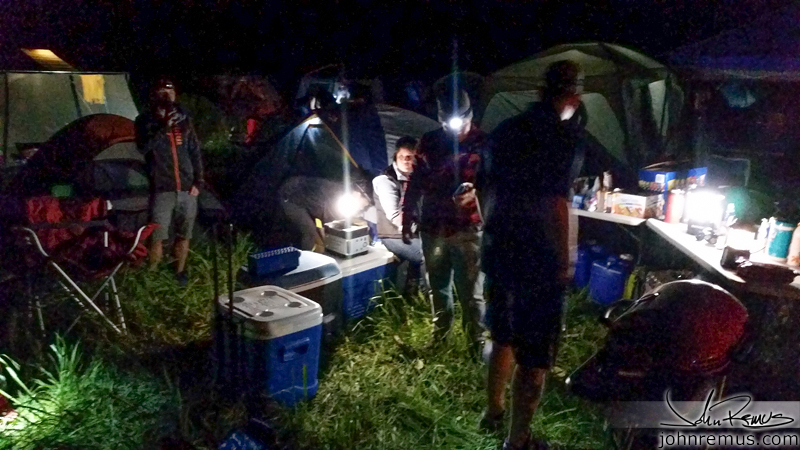 I saw a lot of people continuing to walk like they were out for a casual night-hike and not a night-race. 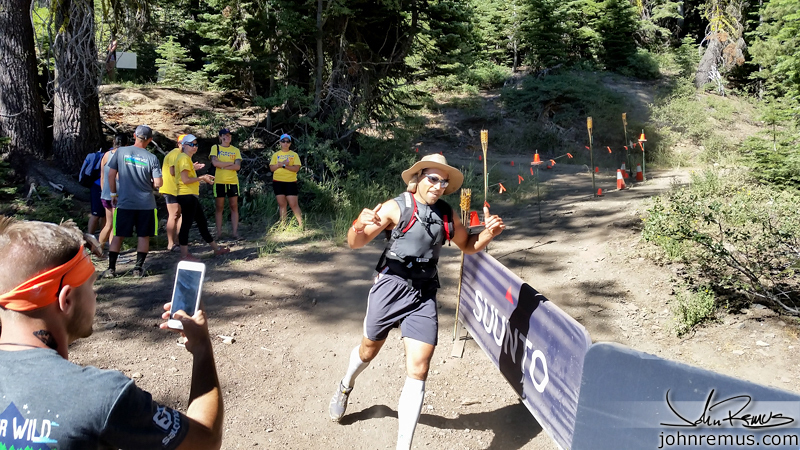 During the descent there were two runners who passed me – the only people to pass me all weekend as it turned out. Then, at 30 minutes into my race I decided to stop and take a look at the stars. My target was 1 hour and I was 2.5 miles in… so I was close to on schedule. I turned off my headlamp and looked up. There were so many stars. Any other time of the year and I would be there sitting with my camera and tripod to take photos of them all. But I still had 3 miles ahead of me. I pressed power to turn my light back on. Nothing. My headlamp had stopped working. I couldn’t help but laugh at the situation. 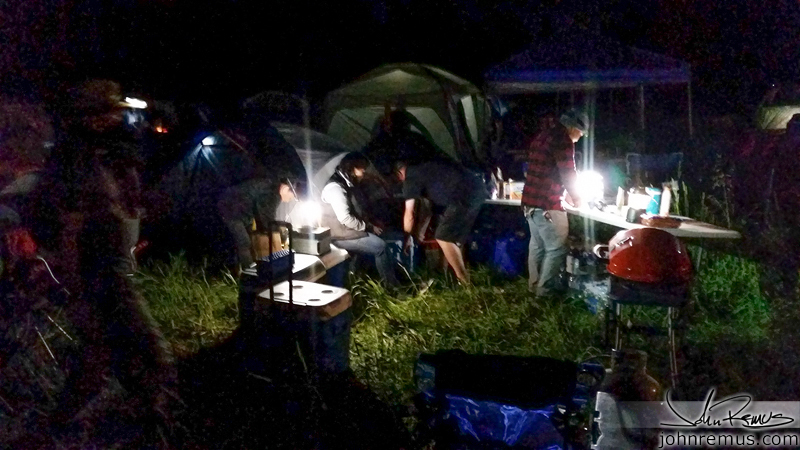 Most notably because right before my race started I was thinking how I left my flashlight in the tent. If you look at the chart above you see the second point in the run my pace plummets for no reason at all? Yeah. That’s because I couldn’t see much of anything. There were people walking and talking behind me whose headlamps were bouncing and occasionally giving me some light that I could use. But we were approaching the trees again so moonlight was no help either. I was trying to determine how much this was going to screw up my time as I clicked my headlamp on and off and walked in the dark. Suddenly my lamp flickered. 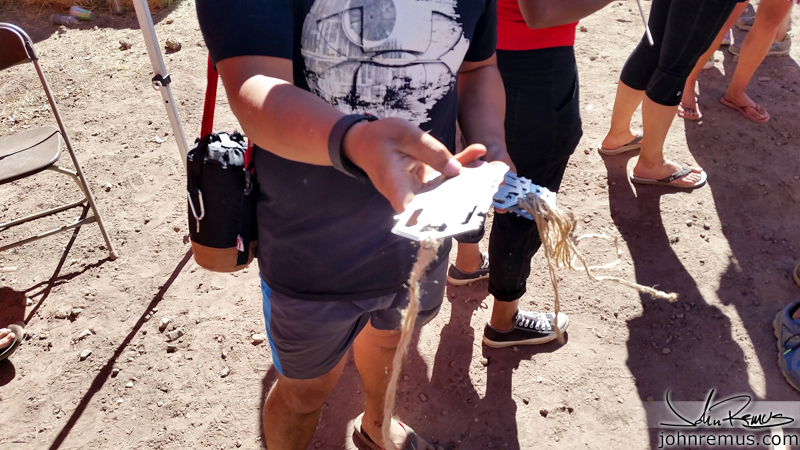 The damn battery plate was just a bit loose. You’ve GOT to be kidding me. It was that simple. After getting my headlamp working again I started back on my run. The rest of the trail was surprisingly dark during most of it since it was largely through the trees. There is no way I would have been able to complete this without additional light. The signs that Ragnar has placed do reflect and light up when hit with light from a headlamp/etc. And they have very very faint LEDs on them to help them stand out. But they are very hard to see from far away. But the worst part of the night running? THE DUST. The dust kicked up by everyone on the trail just hung in the air. There was zero breeze at all. So my headlamp just illuminated the dust (and others I talked to had the same issue). So it was like running in the fog for anyone who has done that. 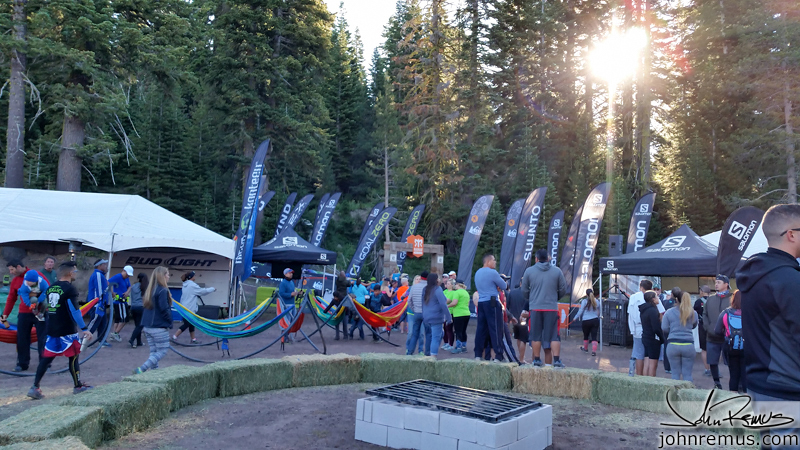 After wrapping up my run, and handing off the run bib to Michael, I headed back to the campground. 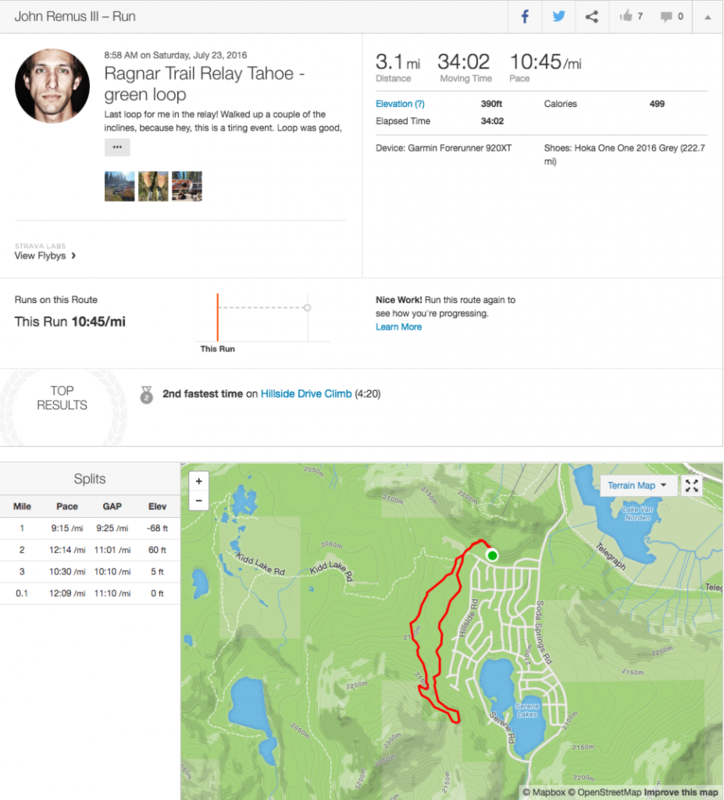 I downloaded my race to Strava, let my family know I finished my night run via text. And did some calculations in my head as to when my next run was going to be. Originally we guesstimated my Yellow loop would be around 730p with my Green loop at 3a. But with my Yellow at 930p, and having solid data for people mountain-pace, my Green loop looked like it would be closer to 7a or 8a. I got ready for bed after cleaning up the best I could (damn did I want a shower though), crawled into my sleeping bag and crashed. 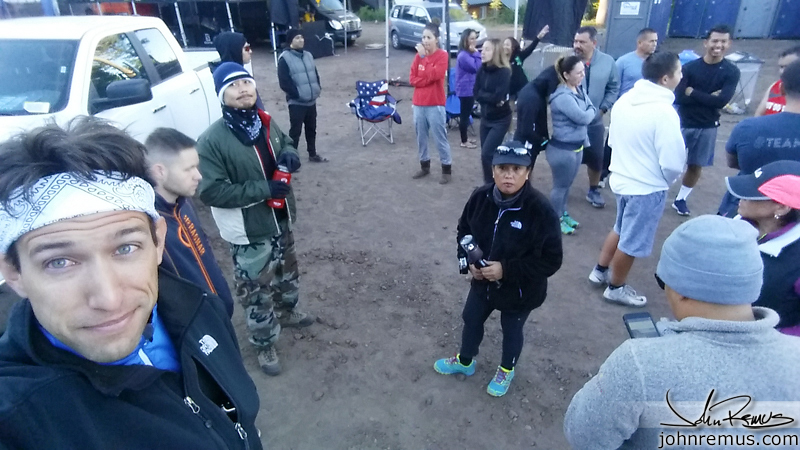 Here’s part of the team early that morning. Michael had brought two tents. 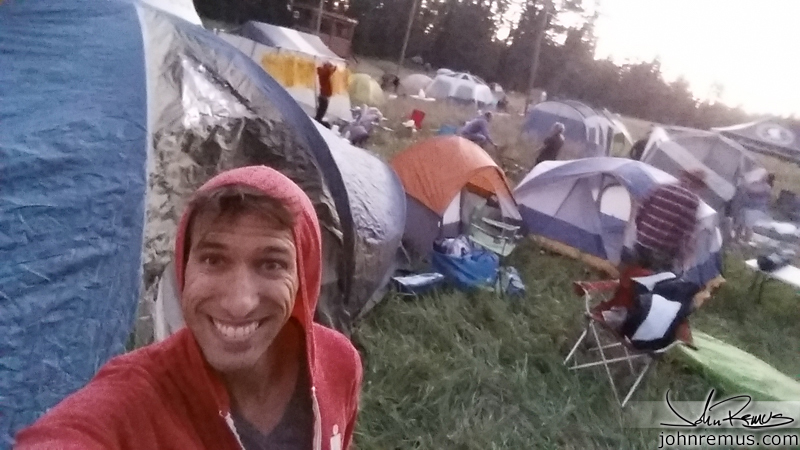 Most all the men were in this one, save Cameron who brought his own tent. 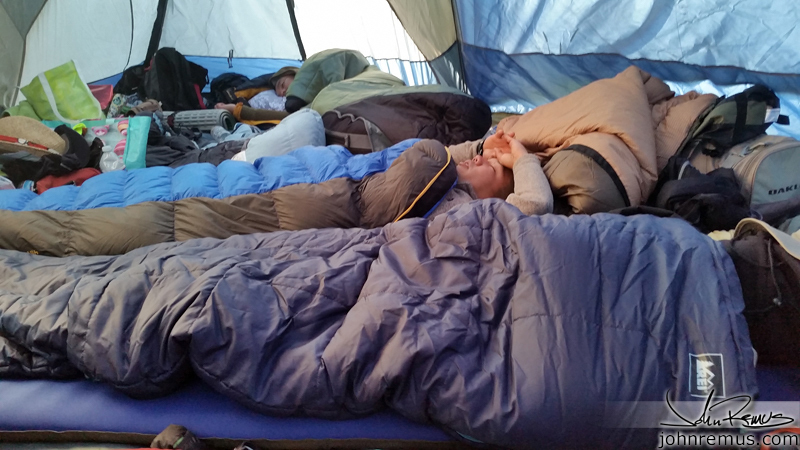 And two of the women were in the smaller tent next to ours, with the third (Nikki) staying with us in the large one. 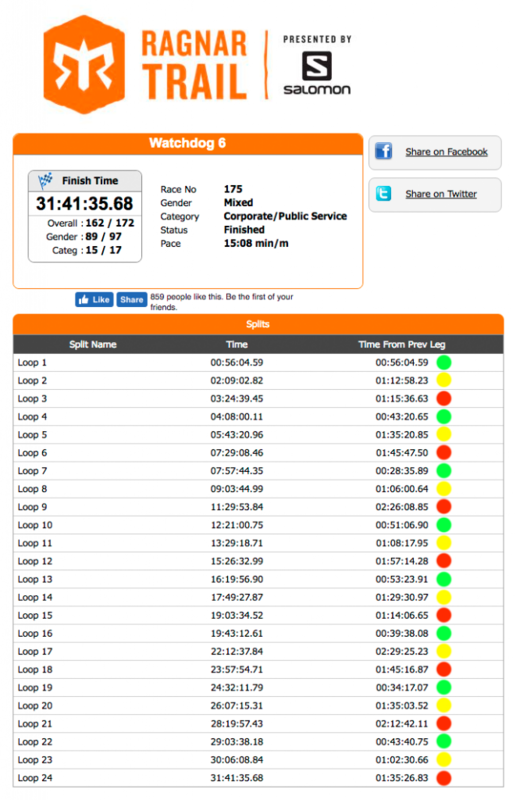 Part of the race I was curious about was how exactly we were going to keep track of everyone racing and knowing when we had to wake up and be ready. But, everyone did that for themselves on their own. And we were all able to trust everyone to be responsible enough with it. Woo hoo! 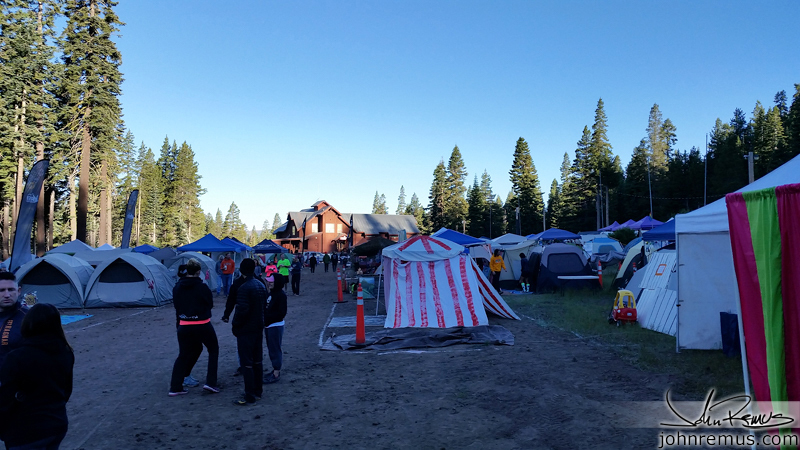 But the camping aspect of Ragnar is exactly what’d you’d expect. 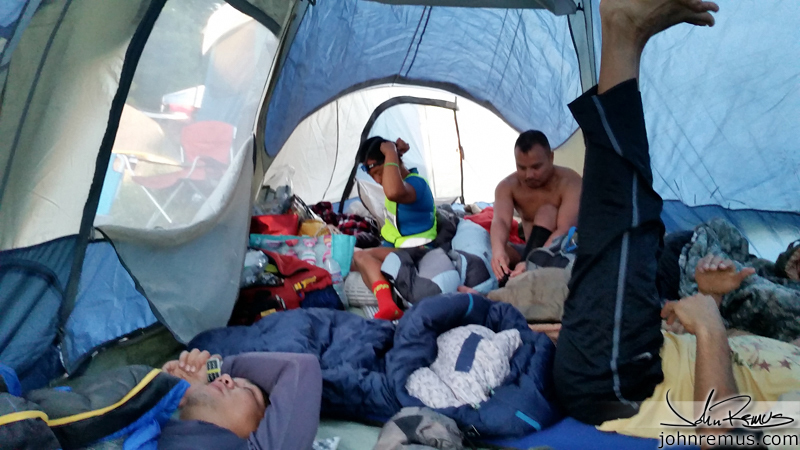 Everyone crashed as soon as they could, trying to get as much rest as they can before/after their night running or morning running. So I went to bed around 11 or 1130 I think with an alarm set for 6 am. But I woke up at 230, again around 4, 5, 630, etc. You hear people coming or going. 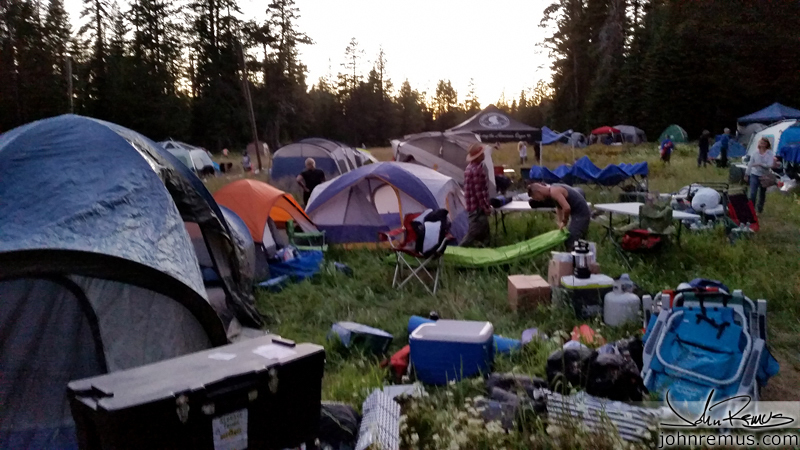 Or perhaps other campers next to your site. And when people would arrive you’d wake up slightly, ask who was running and who was was next if you couldn’t remember, and then determine if you had to get up or could continue sleeping. It sounds bad, but it really wasn’t. Around 630am is when Kimberly got back to camp I think. We could hear her outside the tent talking with her husband Jon. She was exhausted, and maybe half-dead, but she was happy to have finished the race and ahve completed the whole course. 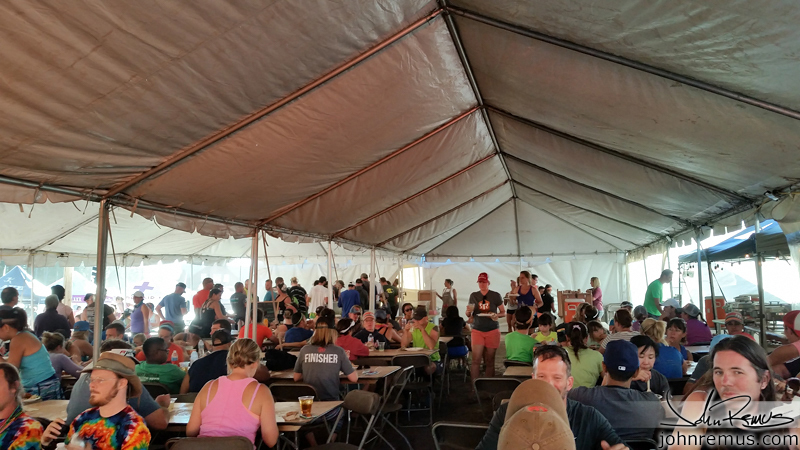 We were all talking through the tent to those that were outside sitting. At some point during this time I got up and started my day, debating what I wanted to wear for my run. After realizing I’d be running at 930, I simply went with tank and shorts… because it was already getting hot out. Green loop is really just called the easy loop because it’s being compared to Yellow and Red. It’s still a solid run with some good climbing in it. So don’t be fooled going out. And certainly don’t go out too hard if you start on this one in the overall race. You actually do hit a 19.4% grade on this run. It’s short, but sharp. I headed out on this loop planning to run the whole thing. 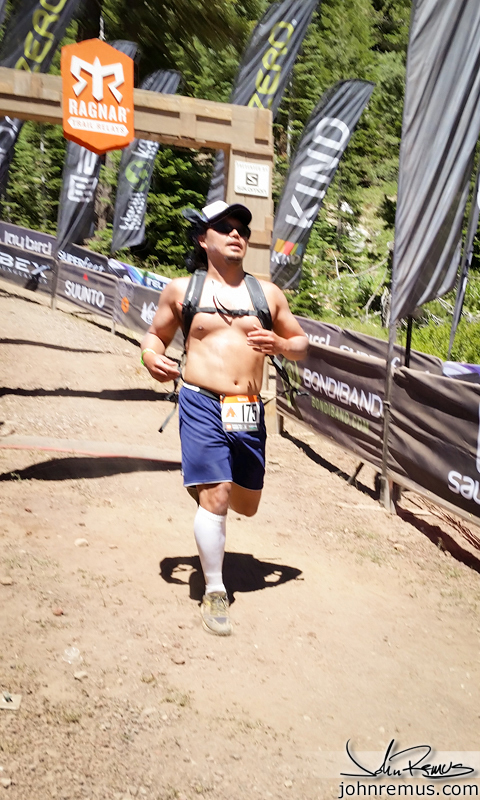 You run up the hill as usual like the other loops out of transition. But then it’s a hard left turn and you run down through camp. 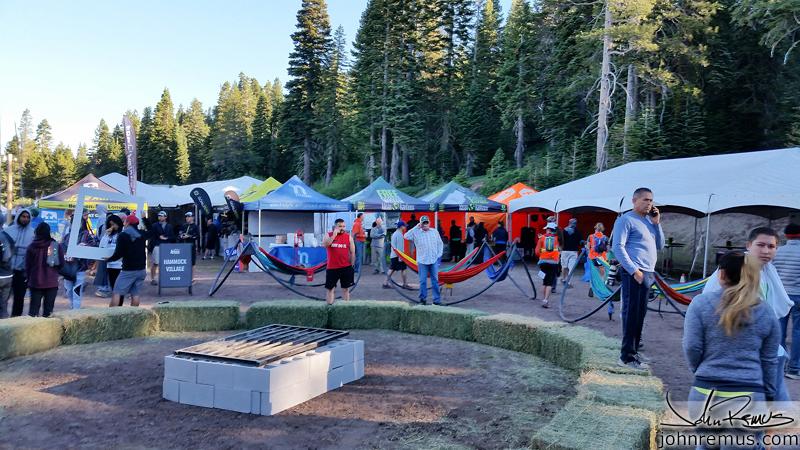 I saw several people go past our campsite that weekend with bibs on. 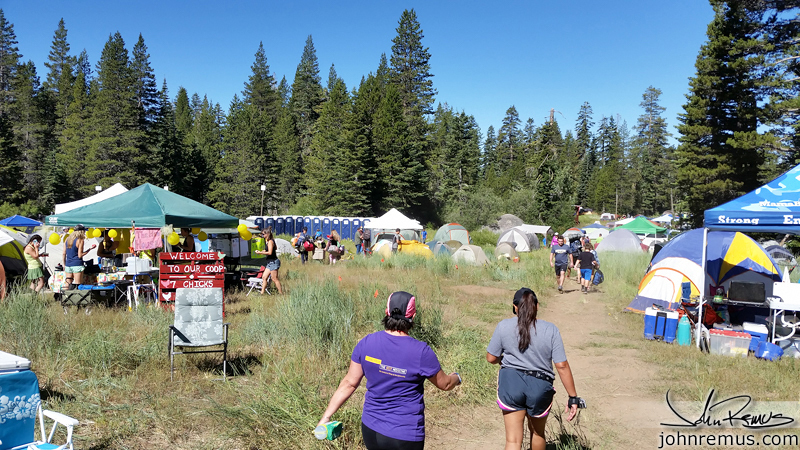 It wasn’t til my last run, Green loop, that I realized those people had actually taken a wrong turn and ended up by our campsite. 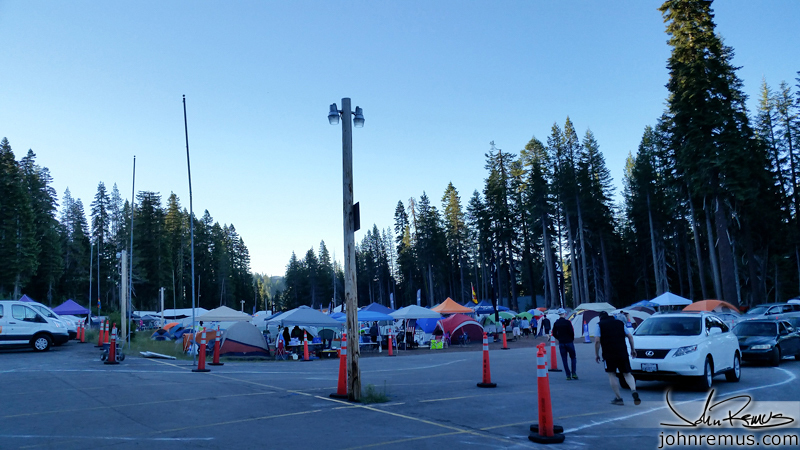 When you “leave” through the campground, you have to stay on the path to the left. There aren’t large visible signs, so I now understood how that would be easy to miss. 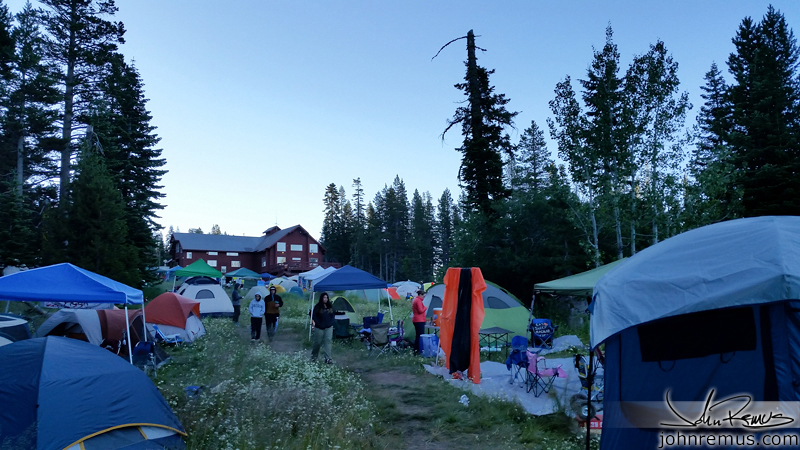 After leaving the campground you hit the street – but only briefly. There is a volunteer there watching for cars that I said hello to as a car passed. He shouted “don’t forget to cross!” to me, and I laughed and thanked him as I crossed the street. I had stayed on my side of the road as the car passed and at the same time, the car was in just the right position to block the sign _telling me to cross_. I would have missed it. And that’s exactly why a volunteer right there was a huge help! Again, the rest of this loop was good. half shaded, half in the sun. Some steep climbs and some large sections through areas with a lot of tan bark, etc. 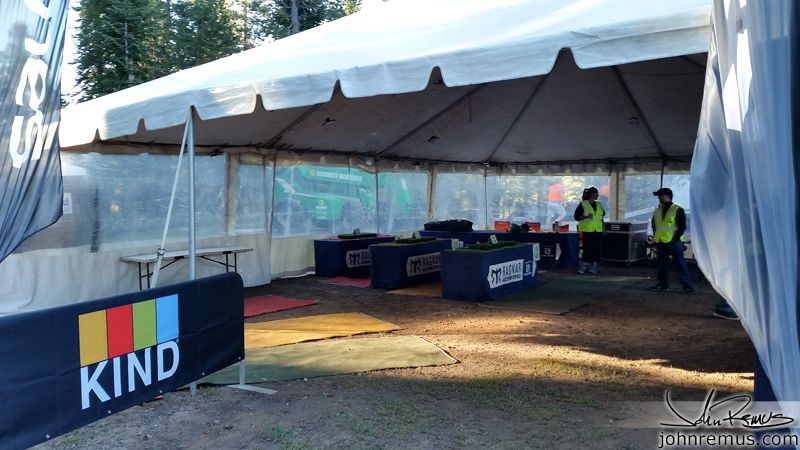 I’m pretty sure those parts of the trail are staging areas for forest crews that work in the area. I slowed down to a hike/walk at two points, the sharp climb, and again at the very end for that last little climb before the finish. After running in I handed off the bib to Michael for the last time, wished him luck on his run, and went back to camp. The rest of the afternoon was pretty easy going for me. I honestly spent most of it hiding in the shade as much as possible. 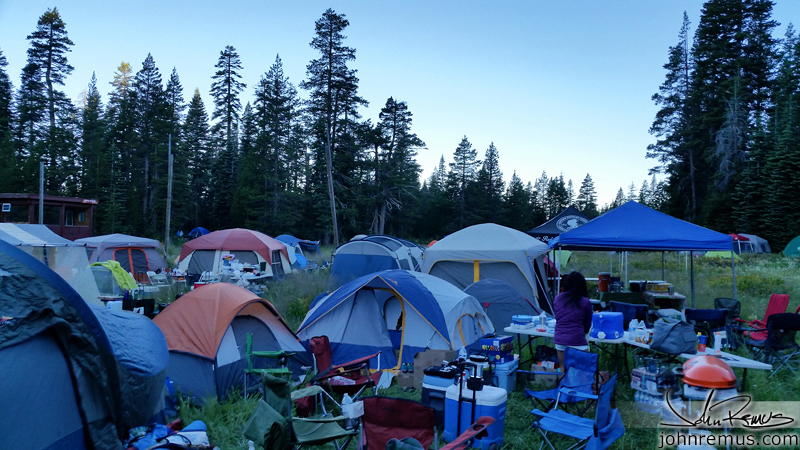 We packed up camp. We also went and got pizza at the vendor there who was making pizzas around the clock. 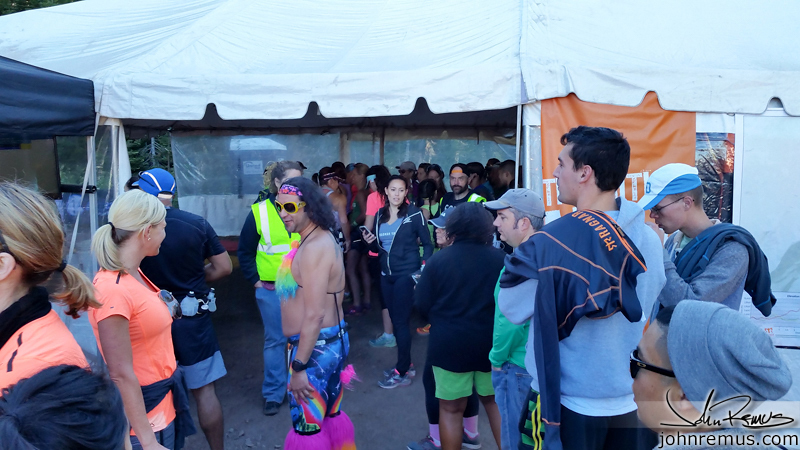 At some point during the day after I ran I went and bought a Ragnar jacket. 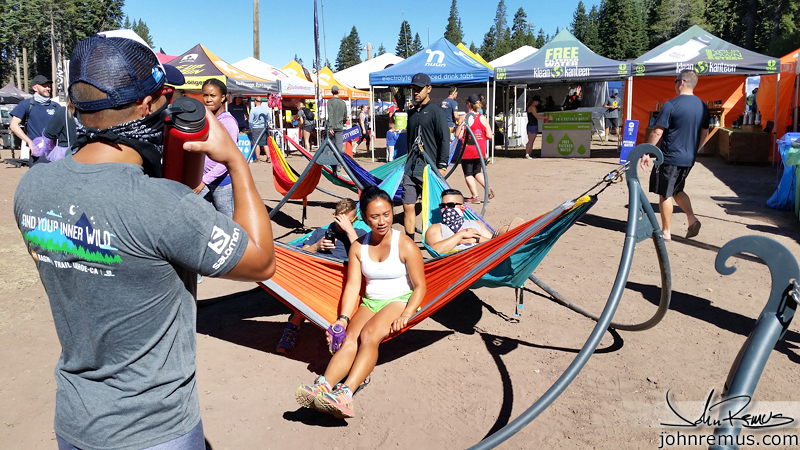 When Aaron, our last runner, went out for the final Red loop we all started carrying all the gear up to the parking lot. Every team was pretty much doing this and there were piles/collections of everyone’s stuff everywhere. For the most part people were kind and didn’t bother anyone else’s things. 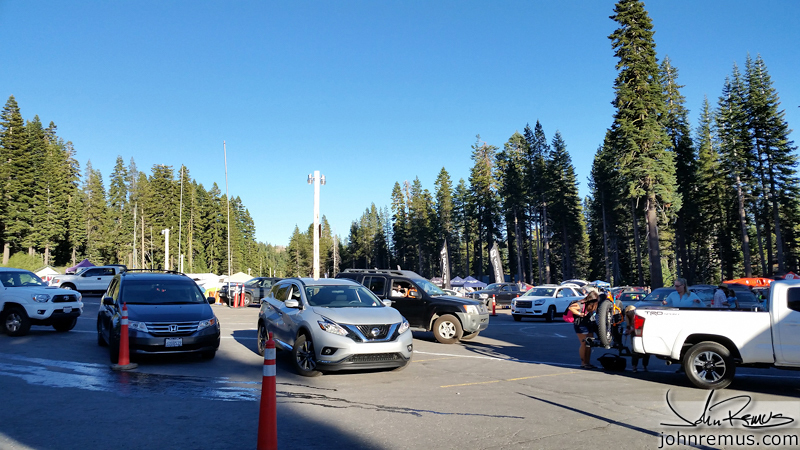 However the drivers who brought there cars/trucks up were the inconsiderate ones… parking their car and walking away. If your stuff isn’t all packed and ready, DON’T bring your car up yet. That’s pretty simple to understand I think. 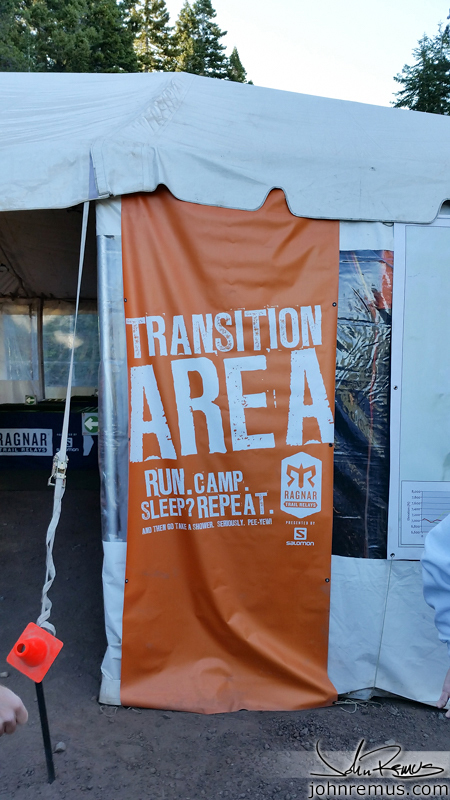 Ragnar does their “finish” a bit different, too. 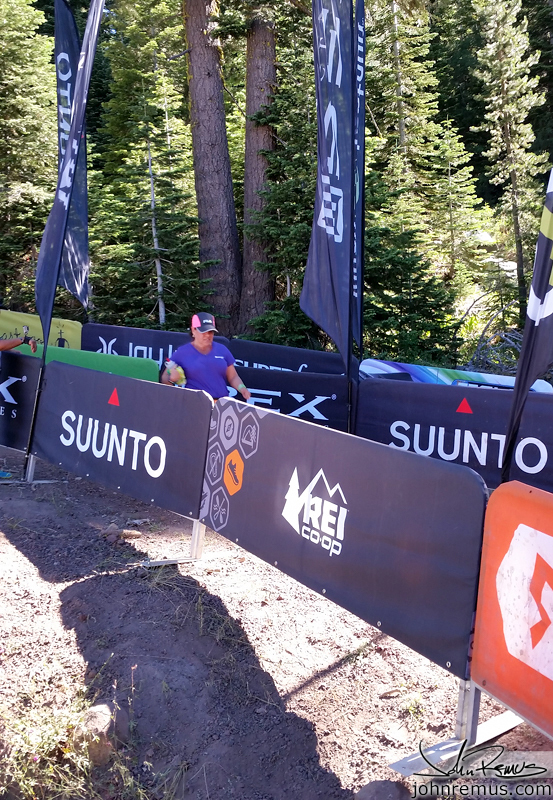 They allow the whole team to run down the chute and cross the finish line as a group. So, we waited for Aaron and as he turned the corner we all ran down the hill with him. After your team is completely done you wait in line for medals. 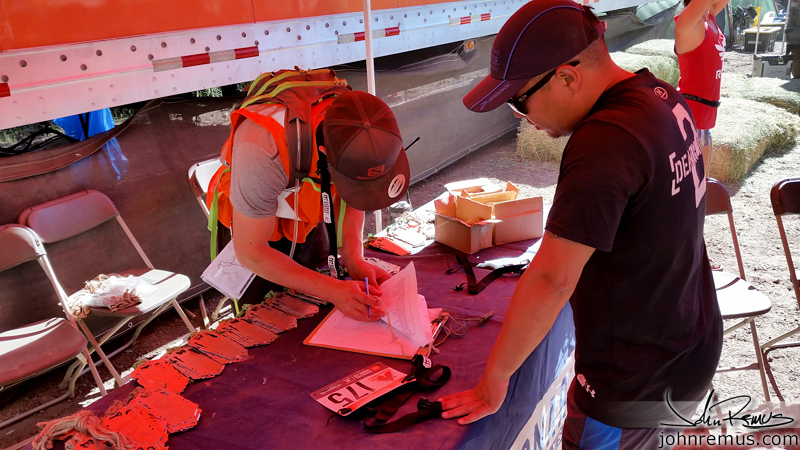 Things were double checked on the checklist, and Michael was given a stack of 8 medals for the team. Immediately after we were able to take group photos from their photo staff on site. 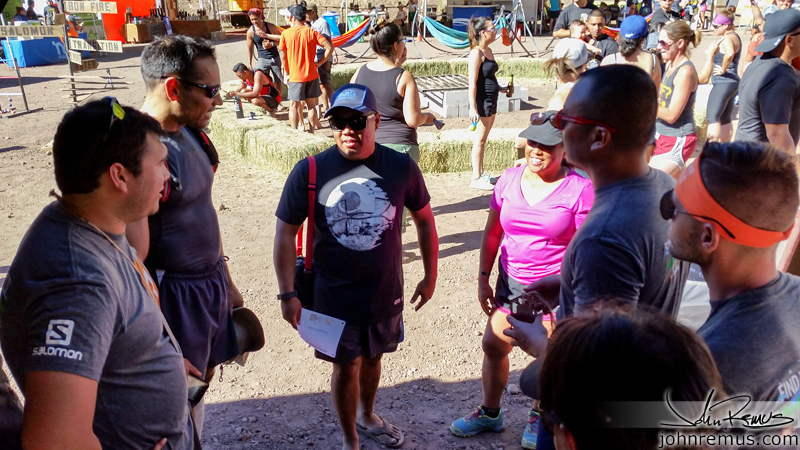 After some pictures of the team, Michael pulled everyone aside and thanked us all for being a part of the event and his cause. 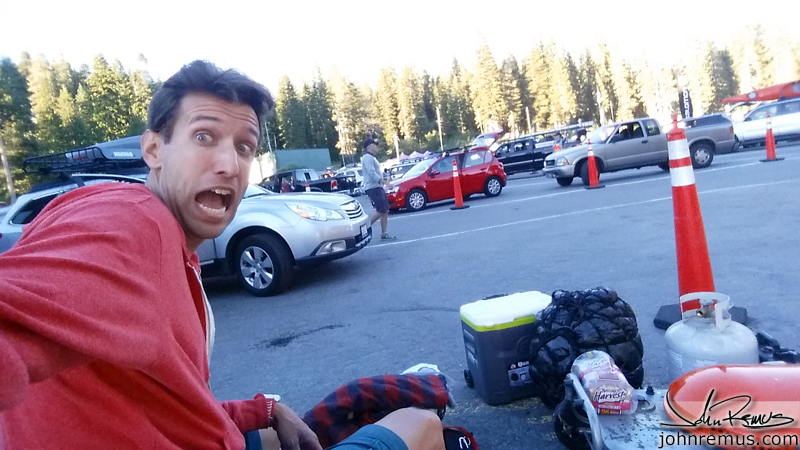 He bought beers for those who wanted one, and we all slowly walked and talked back to the parking lot. Time to go get the trucks and load everything up. Race weekend was over and it was time to go home. Quite simply, I’m glad I did it. As I said earlier, this was one of the events I wanted to do this year when I planned my 2016 race calendar. 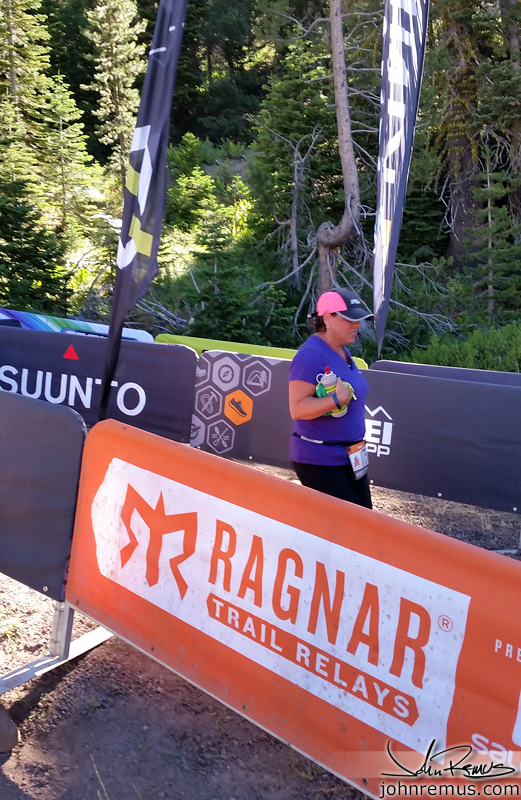 I wanted to do Ragnar Tahoe because I knew it would be hard, and I like a challenge. That’s why I do Ironman. 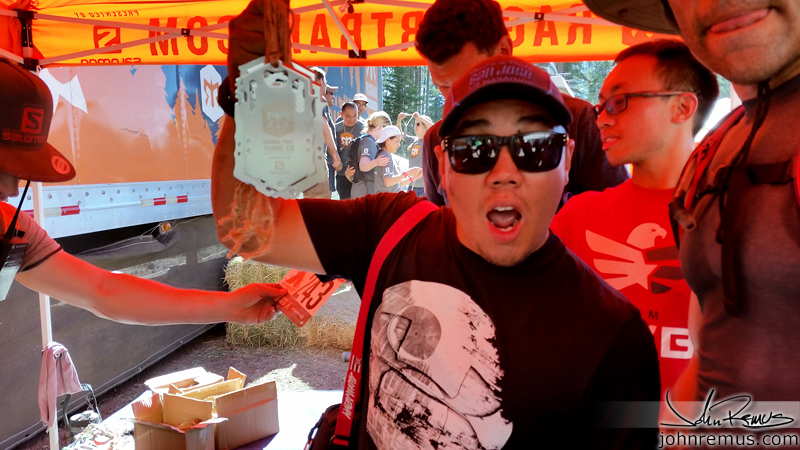 Would I do Ragnar Tahoe again? Probably. 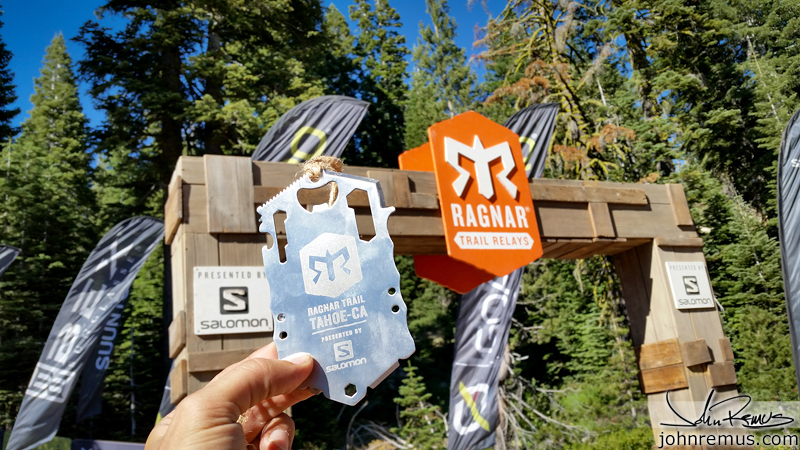 But I think as far as Ragnar events go I want to do one of their road relays next, possibly Cape Cod with a friend out there if I can manage it next Spring. My team that I ended up on, Watchdog6, was awesome. A great group of people, most semi local to where I live, too! 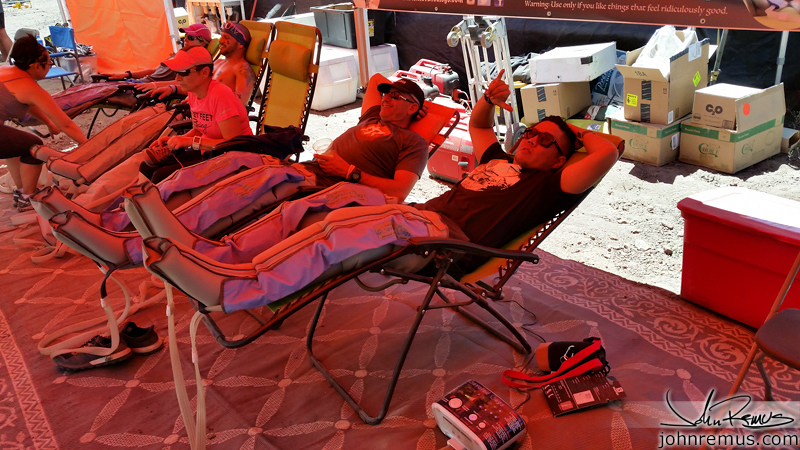 And not only was everyone fun to hang out with, but they were trustworthy during the race to help each other and make sure we all knew who was doing what and when. And that can be hard to find with large groups. 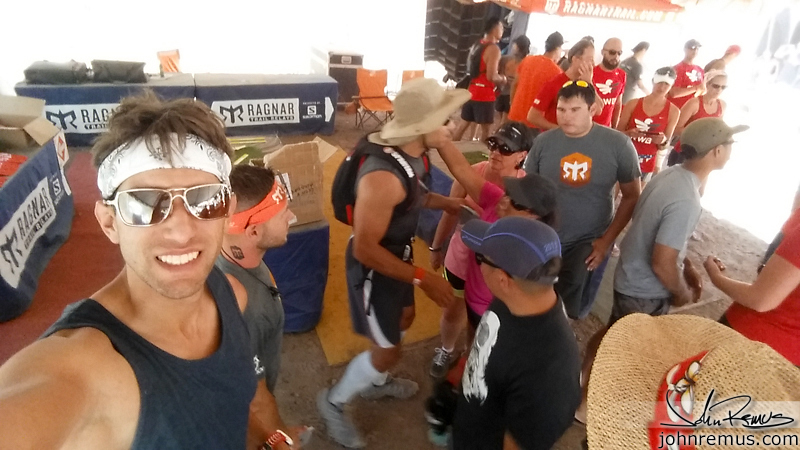 I really enjoyed Ragnar. 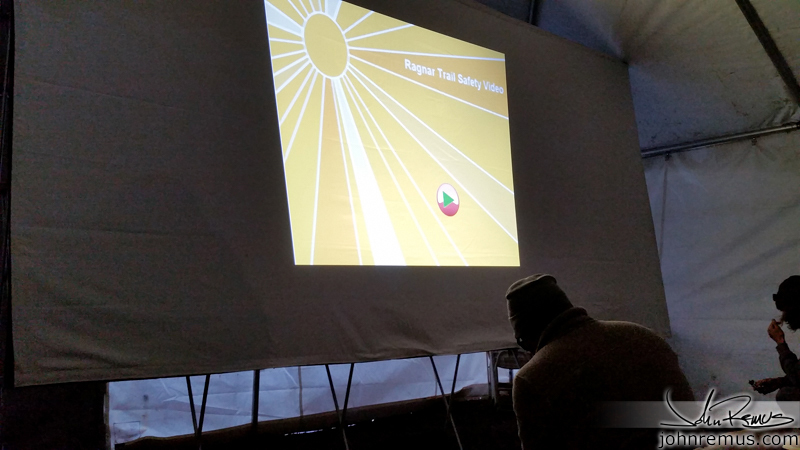 They had a great program, it was well organized and set up. They do their best to make it an event everyone has every opportunity to complete while also making it hard and competitive for the teams looking for that, too. So here are a bunch of the images I shot through the weekend. They’re just from my phone… which, let’s face it, phone photos are usually pretty terrible. Sometimes they’re awesome, other times they’re not. For some reason, most of mine came out terrible. And I had zero desire to use any of my professional gear that weekend. We were going to be camping down in this field. We were mostly hanging out chatting. 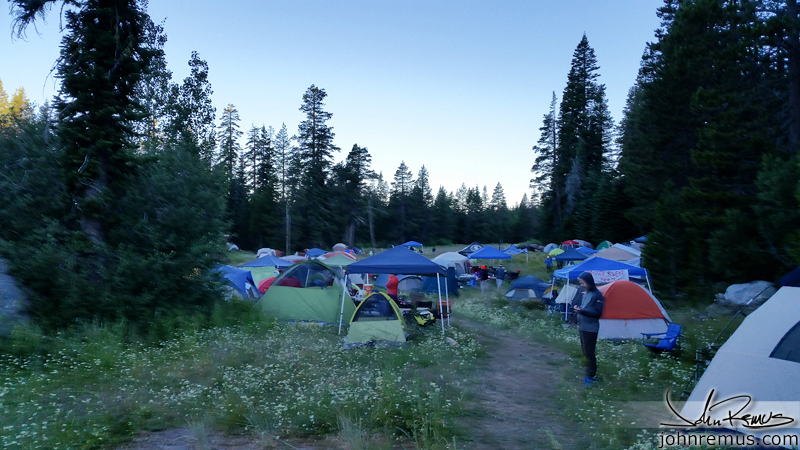 Also there were people still arriving and setting up their tents and campground in the dark. 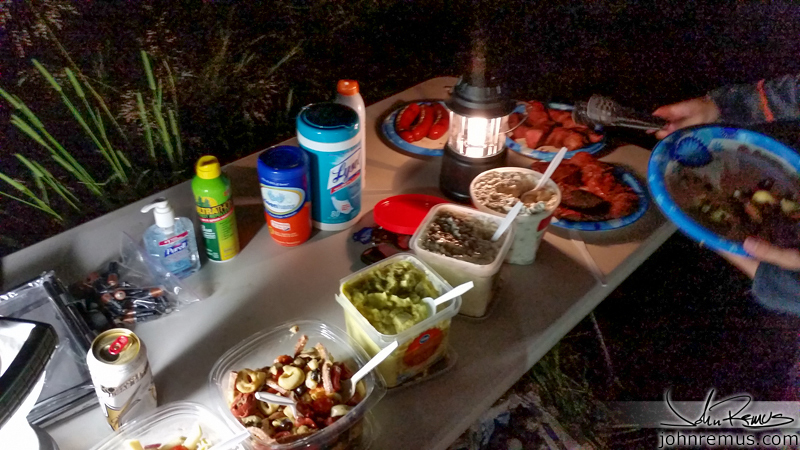 Dinner was steak, hotlinks, various salads, etc. Tons of food that night that Michael, Jon, and everyone planned. Of course I didn’t know this and ate before I arrived. haha! 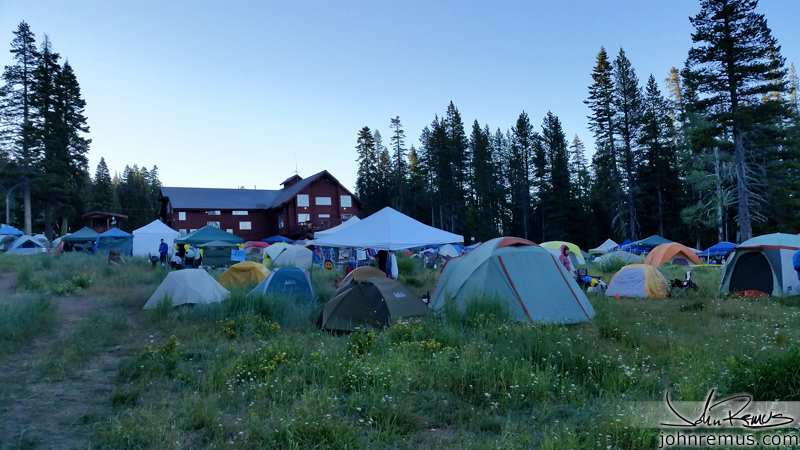 A lot of camp was still asleep and slowly starting their day. This is the view back down into the field. 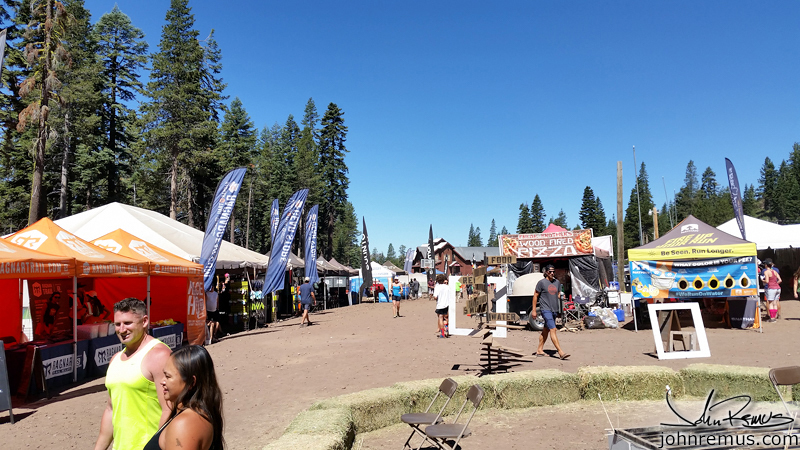 Looking back through the main camp and vendor area back toward the parking lot. This is a large dirt parking lot. 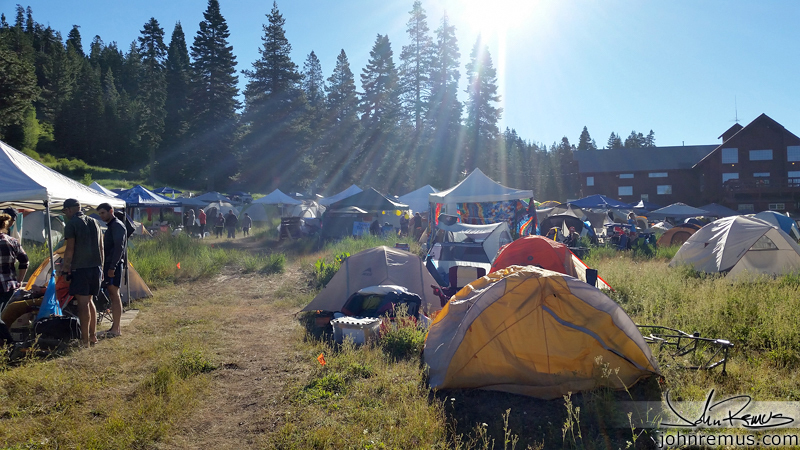 People camping here are competing for “best campsite” with decorations. But it’s hot, dry, dusty, and busy. 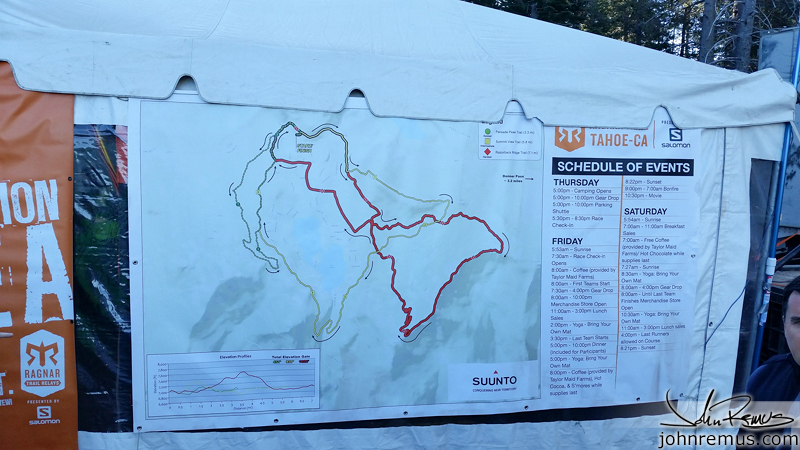 The map and schedule. I took a picture in case I needed it… didn’t look at it again all weekend though. haha! 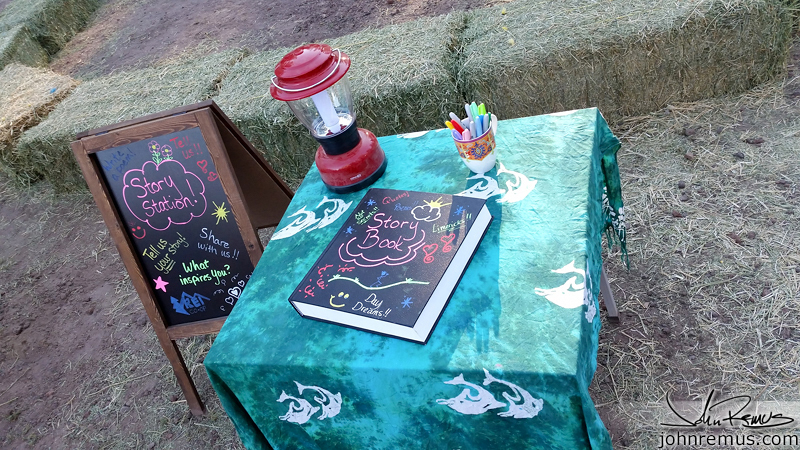 Share a story from your weekend! Later that morning, walking back to the start to cheer on Kimberly as she heads out to start our relay team! An hour later or so we were back and hanging out waiting for Kimberly’s return. Nikki is next, suited up, and ready to run. After this I ran my first leg, the Red loop. Which you read about above. All throughout the day this area was packed as teams all had their starts at various hours and cheered on their starters! Later that evening we lined up to get dinner. Dinner was pasta, with a red sauce (meat or vege), bread, and salad. With lemonade or iced tea. It comes included in your race entry. The dinner was fine, but I think they burned the pasta because it had a smokey taste. Still edible and not horrible, just… not as tastey as you hope when you’re hungry. But hey, honest mistake and they have a LOT of people to cook for. 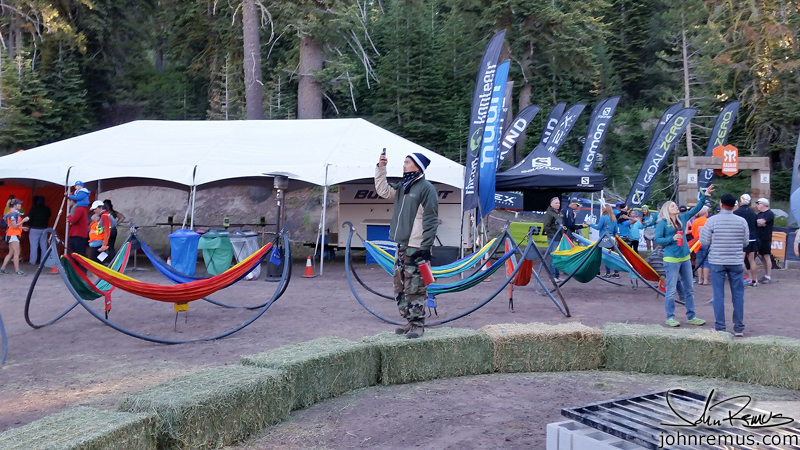 8pm that night.. everyone is laying down resting and either taking a nap, or simply conserving energy for their runs later that night ahead. And that morning.. at 8am, twelve hours later. Four of our team shown, and two more beside me. Done with my races. Legs aren’t destroyed. Actually, I felt really good. A solid indicator of people’s readiness for this event was how well they were walking and moving at this point in the race weekend. 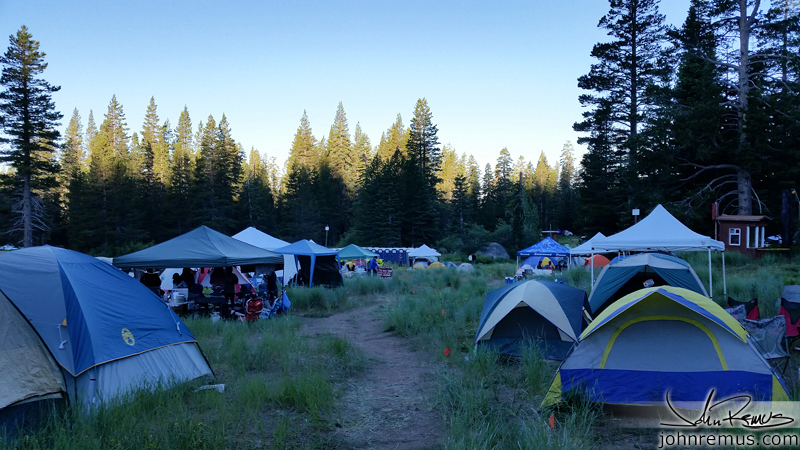 Many people you found in camp were sitting, limping, or in pain from underestimating the course. 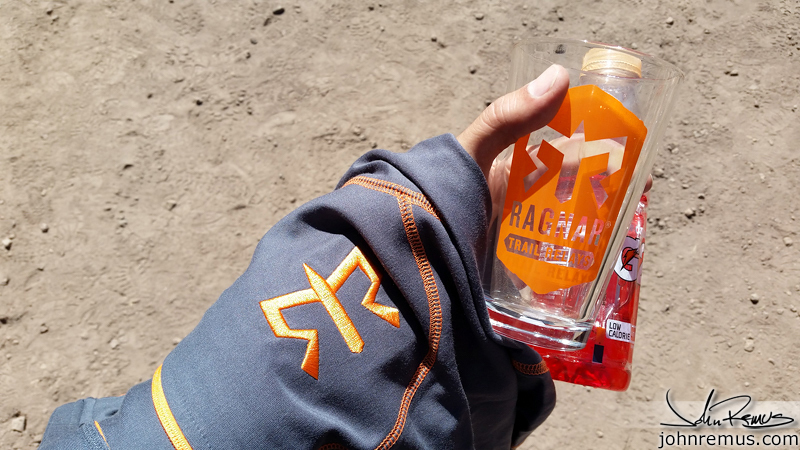 With my running done, and our team well on track to finish in time, I went to buy a jacket and glass. I have glasses from all my Ironman races, and now this one to add to the collection. Now we’re at the end of the entire day. 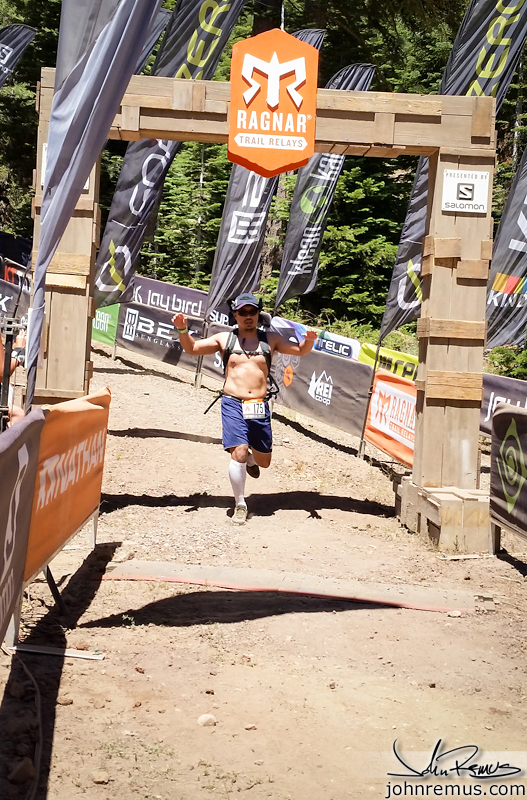 Here comes Aaron, wrapping up our last leg of the race! I smiled, but it immediately hurt because my lips were burned/chapped from the sun/heat/altitude. I wasn’t dehydrated and drank water nonstop. But yeah. I had forgot my chapstick, and the store had sold out of their supply. bummer! So based on this I guessed we finished in juuuuust under 31 hours and 42 minutes. And I was correct! And check out my step count that day. I ran only 3 miles on my leg that morning, and had since already walked an additional FIVE. Ok, well, I got the sorta boring back… haha! 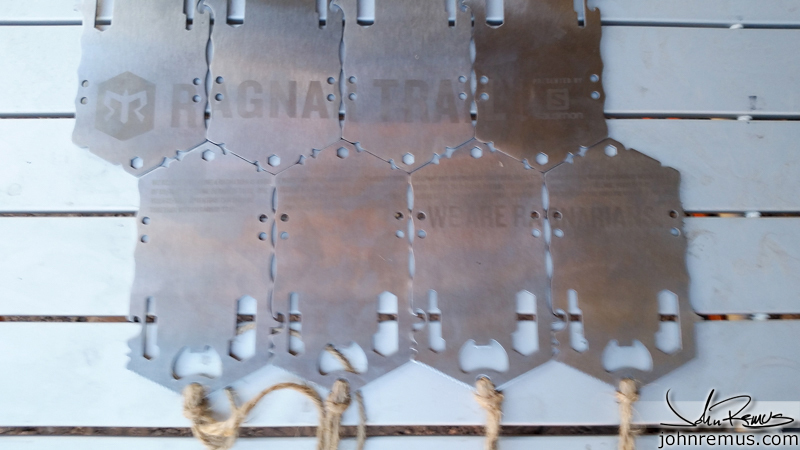 All the medals go together as a team on the backside. Done! Time to load up and head out. Packed up and headed out. 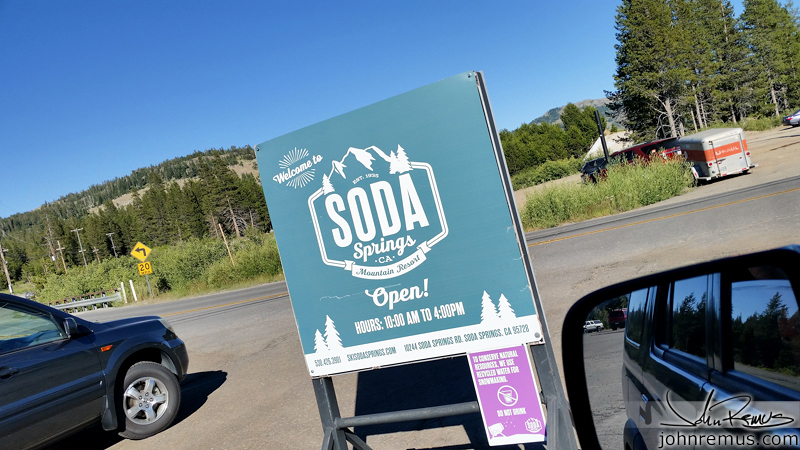 Goodbye Soda Springs! You were great! After cleaning up my gear I had to take my normal photos for various social channels. I actually own a ton of different running shoes. 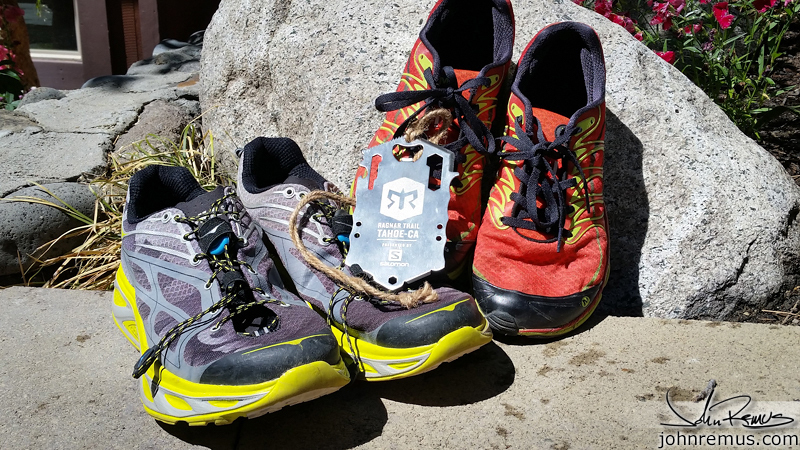 This weekend I used Hoka One One’s and Merrell’s. But for those curious, I have another pair of Hoka’s I still use, three different pairs of Nikes, and a pair of Puma’s. So, you know.. plan for which ones you think suits your race. haha! 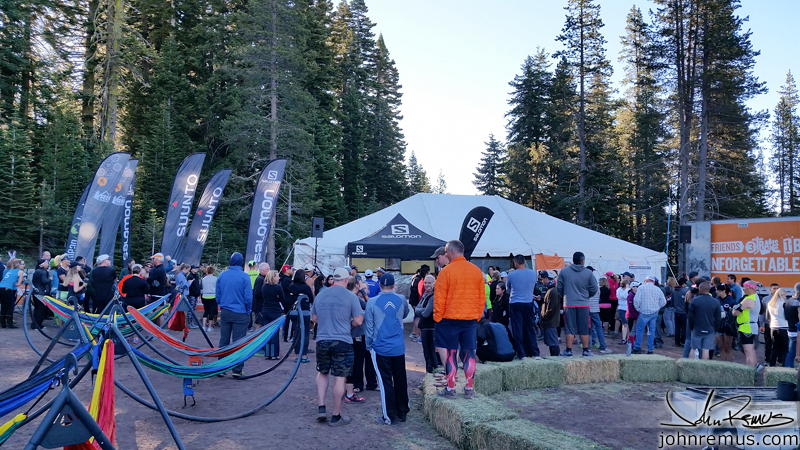 This entry was posted in personal, race report, sports and tagged endurance, fitness, lake tahoe, race report, racing, ragnar, ragnar trail, tahoe, team, trail running, watchdog6. Bookmark the permalink. Thank you SOOOOOOO much for your detailed report! 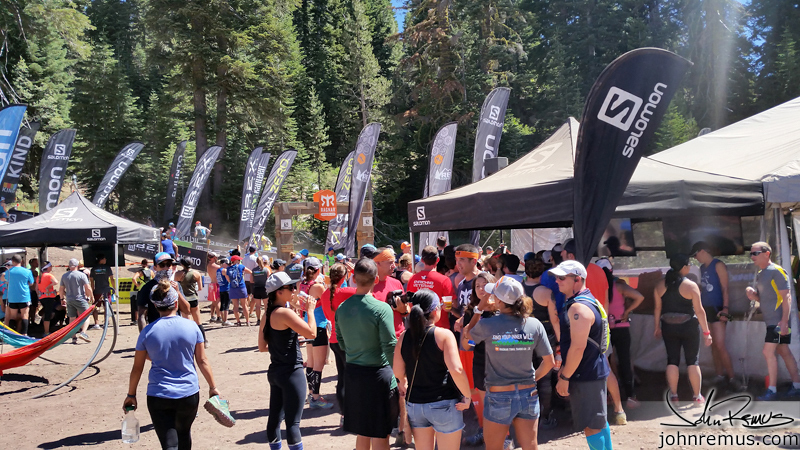 We’re running an ultra in July and I can’t find ANY info. 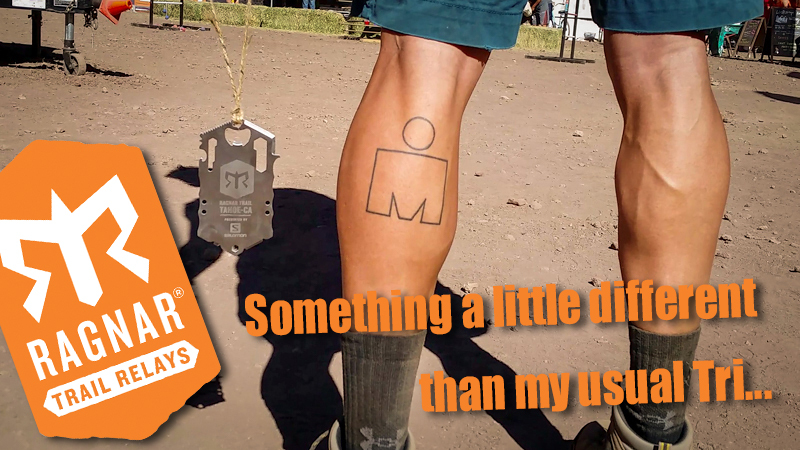 I’m a triathlete too – so you’ve got all the data I want ;) Thanks for sharing!! !